Diploid organisms contain two sets of chromosomes, one set inherited from the mother and the other from the father. Humans, for example, have 23 pairs of chromosomes, and the chromosomes within each pair are said to be homologous because they are similar to each other in a number of ways, including length and shape. When it comes time for one of these cells to duplicate, each chromosome is first replicated to generate a pair of identical chromosomes called sister chromatids, which subsequently separate in a cell division process known as mitosis to produce two identical daughter cells. While most cells proliferate via mitotic cell division, the germ cells that generate gametes in the form of sperm or eggs undergo a different cell division known as meiosis. This process reduces the number of chromosomes by a factor of two, so that the original number of chromosomes is restored by the fusion of gametes during sexual reproduction. During meiotic cell division, a single round of DNA replication is followed by two consecutive rounds of nuclear division called meiosis I and meiosis II. During meiosis I, homologous chromosomes are separated. Subsequently, during meiosis II, the sister chromatids separate to produce a total of four products, each with half the number of chromosomes as the original cell. The separation of homologous chromosomes or sister chromatids relies on them being pulled apart by microtubules. One end of each microtubule is attached to a protein-based structure called a kinetochore, which is assembled onto the centromere of each chromosome. The other end of each microtubule is attached to a structure that is called a centrosome in human cells and a spindle pole body in yeast cells. Human cells have two centrosomes, which reside on the opposite poles of the cell, and likewise for the spindle pole bodies in yeast cells. In mitotic cells and in meiosis II, microtubules attach to kinetochores in a way that means the sister chromatids are pulled apart. During meiosis I, on the other hand, they attach to kinetochores in a manner so the homologous chromosomes are pulled apart. Miller et al. now show how the timing of the interaction between the kinetochore and microtubules is critical to ensure that the homologous chromosomes are separated during meiosis I. They found that premature interactions resulted in the separation of sister chromatids (as happens in mitosis) rather than the separation of homologous chromosomes, as is supposed to happen in meiosis I. They also showed that cells prevent such premature interactions by dismantling the outer regions of the kinetochore and reducing the levels of enzymes called CDKs in the cell. These results demonstrate that preventing premature microtubule–kinetochore interactions is essential for establishing a meiosis I-specific chromosome architecture, and they also provide fresh insights into how the molecular machinery that is responsible for mitotic chromosome segregation can be modulated to achieve meiosis. Cells have evolved intricate mechanisms to execute proper partitioning of the genetic material during cell division. This task is especially complex in meiosis, the cell division used by sexually reproducing organisms to generate gametes. The goal of meiosis is to reduce the genome content by half such that proper ploidy is maintained upon fusion of gametes. To achieve this, a single round of DNA replication is followed by two consecutive rounds of nuclear division called meiosis I and meiosis II. During meiosis I homologous chromosomes segregate. Meiosis II resembles mitosis in that sister chromatids segregate from each other. The establishment of this specialized chromosome segregation pattern requires three changes that modulate how chromosomes interact with each other and with the microtubule cytoskeleton: (1) reciprocal recombination between homologous chromosomes, (2) the way linkages between sister chromatids, known as sister-chromatid cohesion, are removed from chromosomes and (3) the manner in which chromosomes attach to the meiotic spindle. Homologous recombination is initiated by programmed double-strand breaks (DSBs), which are catalyzed by Spo11 following premeiotic DNA replication (Keeney et al., 1997). Subsequent repair of DSBs by crossover recombination generates physical linkages between homologous chromosomes. This, in turn, allows homologs to attach to the meiosis I spindle such that each homolog interacts with microtubules emanating from opposite spindle poles. As a result, homologous chromosomes biorient on the meiosis I spindle. The spindle assembly checkpoint prevents the onset of chromosome segregation until this process is completed. Once each pair of homologs is bioriented, checkpoint signaling ceases and anaphase entry ensues. A ubiquitin ligase known as the anaphase promoting complex/cyclosome and its specificity factor Cdc20 (APC/C-Cdc20) targets Securin for degradation, relieving Separase inhibition (Cohen-Fix et al., 1996; Ciosk et al., 1998). Separase is a protease that cleaves the kleisin subunit of cohesin, the protein complex that mediates sister-chromatid cohesion (Uhlmann et al., 1999, 2000; Schleiffer et al., 2003). In meiosis I, cleavage of cohesin at chromosome arms allows homologs to segregate (Buonomo et al., 2000). However, cohesin around the centromeres is protected from cleavage during meiosis I, which is essential for the accurate segregation of sister chromatids during meiosis II. 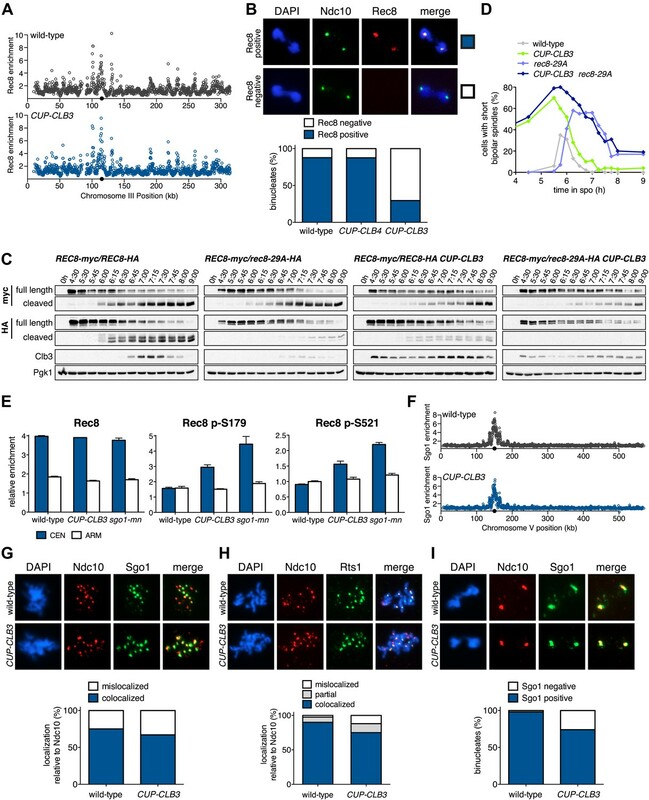 Protection of centromeric cohesin is accomplished by preventing phosphorylation of Rec8, the meiosis-specific kleisin. This occurs, at least in part, by Sgo1 (MEI-S332)-dependent recruitment of the protein phosphatase PP2A to centromeric regions where it antagonizes Rec8 phosphorylation (Kerrebrock et al., 1995; Katis et al., 2004a; Kitajima et al., 2004, 2006; Riedel et al., 2006). The third modification necessary to bring about the meiotic chromosome segregation pattern is the manner in which kinetochores attach to microtubules during meiosis I and meiosis II. In meiosis I, kinetochores of sister chromatid pairs (henceforth sister kinetochores) attach to microtubules emanating from the same spindle pole, a process called sister kinetochore coorientation. During meiosis II, as during mitosis, sister kinetochores attach to microtubules emanating from opposite spindle poles and are thus bioriented (reviewed in Marston and Amon, 2004). In budding yeast, sister kinetochore coorientation is brought about by the monopolin complex, which consists of Mam1, Lrs4, Csm1 and the casein kinase 1, Hrr25 (Toth et al., 2000; Rabitsch et al., 2003; Petronczki et al., 2006). Lrs4 and Csm1 localize to the nucleolus during interphase. During exit from pachytene, a stage of prophase I, Lrs4 and Csm1 associate with Mam1 and Hrr25 at kinetochores, a process that requires the Polo kinase Cdc5 (Clyne et al., 2003; Lee and Amon, 2003; Matos et al., 2008). How the association of monopolin with kinetochores is coordinated with respect to kinetochore assembly and microtubule–kinetochore interactions during meiosis is not understood. Cyclin-dependent kinases (CDKs) are the central regulators of the mitotic and meiotic divisions. In budding yeast, a single CDK associates with one of six B-type cyclins (Clb1-Clb6) (reviewed in Morgan, 1997). In meiosis, Clb5- and Clb6-CDKs drive DNA replication and recombination, whereas Clb1-, Clb3- and Clb4-CDKs promote the meiotic nuclear divisions (reviewed in Marston and Amon, 2004). Meiotic cyclin-CDK activity is regulated both at the transcriptional and translational level (Grandin and Reed, 1993; Carlile and Amon, 2008). Transcription of CLB1, CLB3 and CLB4 occurs only after exit from pachytene (Chu and Herskowitz, 1998); CLB3 is also translationally repressed during meiosis I, thus restricting Clb3-CDK activity to meiosis II (Carlile and Amon, 2008). The major mitotic cyclin, CLB2, is not expressed during meiosis (Grandin and Reed, 1993). Here we investigate the importance of cyclin-CDK regulation in establishing the meiotic chromosome segregation pattern. We show that expression of a subset of cyclins during premeiotic S phase and early prophase I, defined as the prophase stages up to exit from pachytene, causes premature microtubule–kinetochore interactions. This, in turn, disrupts both sister kinetochore coorientation and protection of centromeric cohesin during meiosis I, revealing that the temporal control of microtubule–kinetochore interactions is essential for meiosis I chromosome morphogenesis. Furthermore, we define the mechanism by which premature microtubule–kinetochore interactions are prevented; through regulation of cyclin-CDK activity and of outer kinetochore assembly. Our results demonstrate that preventing premature microtubule–kinetochore interactions is essential for establishing a meiosis I-specific chromosome architecture and provide critical insights into how the mitotic chromosome segregation machinery is modulated to achieve a meiosis I-specific pattern of chromosome segregation. We previously reported that CLB3 expression prior to meiosis I induces a change in the pattern of chromosome segregation such that sister chromatids, instead of homologous chromosomes, segregate during the first nuclear division (Carlile and Amon, 2008). To determine how Clb-CDKs impact meiotic chromosome segregation and whether Clb-CDKs play redundant or specific roles in regulating this process, we examined the consequences of prematurely expressing CLB1, CLB3, CLB4 or CLB5. In our previous studies we expressed CLB3 from the GAL1-10 promoter driven by an estrogen inducible Gal4-ER fusion (Carlile and Amon, 2008). Expression from the GAL1-10 promoter led to Clb3 accumulation in meiosis I to levels that are comparable to those seen in meiosis II in wild-type cells (Carlile and Amon, 2008). However, estrogen interferes with meiotic progression when added during early stages of sporulation (Figure 1A). To circumvent this problem we utilized the copper-inducible CUP1 promoter to drive Clb3 expression. Expression from the CUP1 promoter led to approximately fivefold higher levels of Clb3 protein compared to expression from the GAL1-10 promoter (Figure 1B). To examine the consequences of the two CLB3 constructs on chromosome segregation we used GAL-CLB3 and CUP-CLB3 strains in which one of the two homologs of chromosome III was marked by integrating a tandem array of tetO sequences ∼20 kb from CENIII (heterozygous LEU2-GFP dots). These cells also expressed a tetR-GFP fusion, which allowed visualization of the tetO arrays (Michaelis et al., 1997). The analysis of GFP dot segregation during the first meiotic division revealed that despite the difference in Clb3 protein levels, the extent of sister chromatid segregation in meiosis I was similar between GAL-CLB3 and CUP-CLB3 cells (Figure 1C). This finding indicates that expression of Clb3 from either the CUP1 or GAL1-10 promoter efficiently induces sister chromatid segregation during meiosis I. Furthermore, the timing of when Clb3 is expressed, rather than the amount of Clb3 present, appears to be the primary determinant of this phenotype. Based on this observation and the finding that all four cyclins showed equal expression when produced from the CUP1 promoter (Figure 1D) we utilized the CUP1 promoter for most subsequent analyses. Characterization of premature cyclin expression and corresponding total CDK activity. (A) Wild-type (A4962) and GAL4-ER (A19151) cells were induced to sporulate. At the indicated time points, an aliquot was removed and treated with estradiol (1 μM). The percentage of cells that had sporulated after 24 hr was calculated as the sum of dyads, triads and tetrads divided by the total number of cells (n > 100 cells counted for each condition). (B) Wild-type (A18686), GAL-CLB3-3HA (A23084) and CUP-CLB3 (A23086) cells also carrying the GAL4-ER fusion were induced to sporulate. After 3 hr, CLB3 was induced. Each culture was treated with estradiol (1 μM) and CuSO4 (50 μM). Cells were harvested after 1 hr of estradiol and CuSO4 treatment for protein extraction. Levels of Clb3 were examined by Western blot analysis. A cross-reacting band was used as a loading reference. (C) Segregation of sister chromatids (equational division) using heterozygous GFP dots integrated at LEU2 (∼20 kb from CENIII) was quantified in binucleate cells from wild-type (A18686), GAL-CLB3-3HA (A23084) and CUP-CLB3 (A23086). Note that the samples were collected from the same experiment described in (B) at a time point when a fraction of the cells had completed meiosis I (6 hr 30 min and 7 hr after induction of sporulation) (n > 100 for each sample). Using a chi-square test (df 1), the fraction of binucleates that display a reductional or equational division was compared between wild-type and GAL-CLB3-3HA χ2 = 166.4, p<0.0001 and between wild-type and CUP-CLB3 χ2 = 108.7, p<0.0001. (D) Wild-type or CUP-CLB-eGFP cells also carrying the GAL4-ER and GAL-NDT80 fusions were induced to sporulate. After 2 hr 15 min, cyclins were induced by addition of CuSO4 (50 μM). Cells were released from the NDT80 block at 4 hr 30 min post transfer to sporulation medium. Cyclin levels monitored by Western blot at the indicated time points in CUP-CLB1-eGFP (A28531), CUP-CLB3-eGFP (A28533), CUP-CLB4-eGFP (A28535) and CUP-CLB5-eGFP (A33199) cells. Pgk1 was used as a loading control. (E) Wild-type (A22678) cells carrying the GAL4-ER and GAL-NDT80 fusions were induced to sporulate and CuSO4 (50 μM) was added 2 hr 15 min after transfer into sporulation medium. Samples were taken at indicated time points to determine DNA content by flow cytometry. By 2 hr 15 min 43% of cells had a 4C DNA content. (F) Left: Wild-type (A28663), CUP-CLB1 (A28665), CUP-CLB3 (A28667), CUP-CLB4 (A28669) and CUP-CLB5 (A28671) cells carrying the GAL4-ER and GAL-NDT80 fusions were induced to sporulate and CuSO4 (50 μM) was added 2 hr 30 min after transfer into sporulation medium. In vitro kinase assays were performed with Cdc28-3V5 (Cdk1) immunoprecipitated from prophase I samples (collected 4 hr 30 min after sporulation induction, at the time of NDT80 block-release) and metaphase I–anaphase I samples (collected 1 hr 30 min after release from the NDT80 block). Right: specific activity was calculated by normalizing the amount of phosphorylated Histone H1 to the amount of immunoprecipitated Cdc28-3V5 using ImageQuant software (Molecular Dynamics, Sunnyvale, CA). Having established a system to effectively express various cyclins prior to meiosis I we next examined the consequences of their premature expression on meiosis I events. We first asked whether misexpression of various cyclins is sufficient to induce spindle formation in cells arrested in pachytene of prophase I, due to lack of the transcription factor Ndt80 (Xu et al., 1995; Chu and Herskowitz, 1998). We induced cyclin expression from the CUP1 promoter 135 min after the induction of sporulation when typically 40–65% of the cells have replicated their DNA (Figure 1E; Blitzblau et al., 2012) and examined spindle pole body (SPB, centrosome equivalent in budding yeast) separation and spindle morphology following induction. As expected, wild-type cells did not form spindles in the absence of NDT80 function. Expression of CLB5 from the CUP1 promoter did not lead to SPB separation and spindle formation either, although expression of CLB5 in the prophase I arrest led to a significant increase in total CDK activity (Figures 1F and 2A, Figure 2—figure supplement 1). In contrast, CUP-CLB1, CUP-CLB3 and CUP-CLB4 cells separated SPBs and formed bipolar spindles, shortly after copper addition (Figure 2A and Figure 2—figure supplement 1). Similar results were observed in cells with intact NDT80 (data not shown). We conclude that expression of CLB1, CLB3 or CLB4 is sufficient to promote bipolar spindle assembly in NDT80-depleted cells. 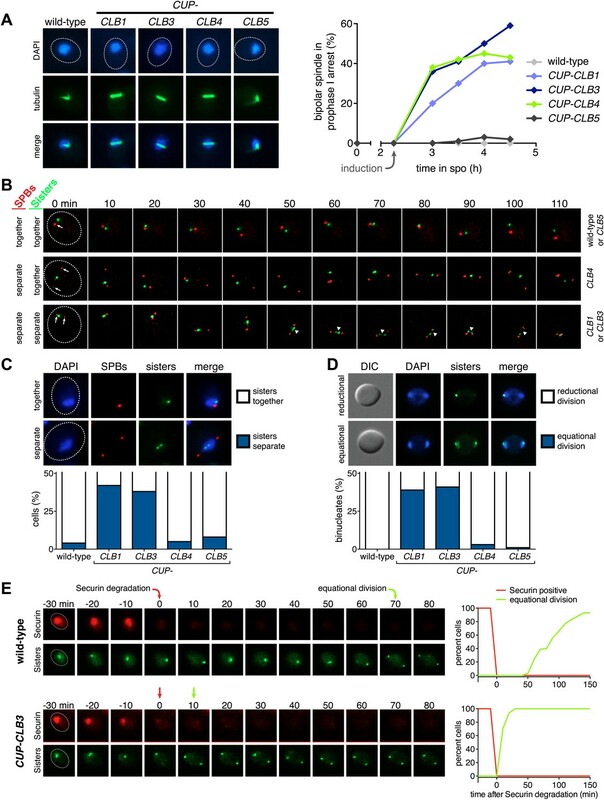 Premature expression of CLB1 or CLB3 causes sister kinetochore biorientation during prophase I and sister chromatid segregation in meiosis I.
Wild-type or CUP-CLB cells were induced to sporulate. After 2 hr 15 min, cyclins were induced by addition of CuSO4 (50 μM). Cells were either arrested during prophase I or released from an NDT80 block 4 hr 30 min after induction of sporulation. (A) Bipolar spindle formation determined in wild-type (A22678), CUP-CLB1 (A27421), CUP-CLB3 (A22702), CUP-CLB4 (A27423) and CUP-CLB5 (A27425) during prophase I (n = 100 per time point). Images on left show spindle formation in CUP-CLB cells 4 hr after induction of sporulation; in this and all subsequent Figures microtubules are shown in green and DNA in blue. The dotted line depicts the cell membrane. (B) Microtubule–kinetochore engagement monitored during prophase I, starting at 1 hr after CuSO4 addition in wild-type (A30700), CUP-CLB1 (A30702), CUP-CLB3 (A30704), CUP-CLB4 (A30707) and CUP-CLB5 (A30708) by live cell microscopy. SPBs (marked by arrow) and heterozygous CENV-GFP dots are shown (arrowheads mark separated CENV dots). In this and all subsequent figures SPBs are in red, GFP dots are in green. (C) Top panel: representative images of wild-type (A30700) and CUP-CLB3 (A30704). Bottom panel: separation of heterozygous CENV-GFP dots in prophase I-arrested cells quantified in wild-type (A22678), CUP-CLB1 (A27421), CUP-CLB3 (A22702), CUP-CLB4 (A27423) and CUP-CLB5 (A27425) by live cell microscopy (over the duration of 8 hr, n > 100) as described in the ‘Materials and methods’. The fraction of nuclei that display sister kinetochores as separate or together for each CUP-CLB strain was compared to wild-type using a chi-square test (df 1): CUP-CLB1, χ2 = 40.77, p<0.0001; CUP-CLB3, χ2 = 34.84, p<0.0001; CUP-CLB4, χ2 = 0.1163, p=0.7330; CUP-CLB5, χ2 = 1.418, p=0.2337. (D) Segregation of sister chromatids (equational division) using heterozygous CENV-GFP dots quantified in binucleates from wild-type (A22678), CUP-CLB1 (A27421), CUP-CLB3 (A22702), CUP-CLB4 (A27423) and CUP-CLB5 (A27425) (n = 100). The fraction of binucleates that display a reductional or equational division for each CUP-CLB strain was compared to wild-type using a chi-square test (df 1): CUP-CLB1, χ2 = 45.13, p<0.0001; CUP-CLB3, χ2 = 48.22, p<0.0001; CUP-CLB4, χ2 = 1.020, p=0.3124; CUP-CLB5, χ2 = 0, p=1. (E) Wild-type (A31019) and CUP-CLB3 (A31021) cells monitored for segregation of heterozygous CENV-GFP dots with respect to Pds1 (Securin, red) degradation by live cell microscopy (n > 17). Time of Pds1 degradation set to t = 0, percent cells were plotted as a Kaplan–Meier curve. Note that for A31021, the analysis of cells that segregate sister chromatids in the first nuclear division is shown. Pds1 accumulation during prophase II is not observed using the Pds1-tdTomato construct, likely due to delayed maturation of the fluorophore (Katis et al., 2010). Next, we determined whether expression of CLB1, CLB3 or CLB4 in pachytene-arrested cells also affects the manner in which chromosomes attach to the meiotic spindle using live-cell imaging. To this end we used strains carrying heterozygous CENV-GFP dots and an Spc42-mCherry fusion (Spc42 is an SPB component) to monitor the behavior of the marked centromere with respect to the spindle axis. In wild-type and CUP-CLB5 cells, sister kinetochores remained closely associated with each other and did not appear to be tightly associated with SPBs, consistent with the observation that these cells failed to form a spindle. In contrast, we observed dynamic separation of heterozygous CENV-GFP dots upon expression of CLB1 or CLB3, with sister kinetochores frequently splitting and coming together (Figure 2B,C). This observation is reminiscent of the behavior of bioriented sister chromatids during metaphase of mitosis (Pearson et al., 2001). Cells expressing CLB4 did not show transient splitting of sister kinetochores in prophase I, indicating that chromosomes are either unable to attach to the spindle or that homologous chromosomes, instead of sister chromatids, are bioriented as occurs in wild-type cells during metaphase I. To distinguish between these possibilities, we examined the behavior of CUP-CLB4 cells in which both homologs of chromosome V harbor CENV-GFP dots (henceforth homozygous CENV-GFP dots). Similar to wild-type, we observed that in CUP-CLB4 cells the two CENV-GFP dots remained tightly associated in prophase I, indicating that the homologous chromosomes are paired and not attached to the prematurely formed spindle (Figure 2—figure supplement 2). Together, these results indicate that CUP-CLB1, CUP-CLB3 or CUP-CLB4 expression promotes bipolar spindle formation in pachytene-arrested cells, but only CLB1 and CLB3 expression can promote stable microtubule–kinetochore attachments sufficient to generate tension. To determine whether different amounts of total CDK activity were responsible for the phenotypic differences of prematurely expressing Clb1 or Clb3 compared to Clb4, we measured total CDK activity (Cdc28 in budding yeast) using Histone H1 as a substrate. Cdc28-associated kinase activity was low during prophase I and increased more than 25-fold during metaphase I/anaphase I in wild-type cells (Figure 1F). Expression of all four cyclins led to a significant increase in total CDK activity in prophase I (Figure 1F), but importantly, the degree of increase did not correlate with the ability to induce sister chromatid splitting in the NDT80 arrest. For example, Clb1 expression led to a similar increase in Cdc28-associated kinase activity as expression of Clb4, yet Clb1 induced sister chromatid splitting whereas Clb4 did not (Figures 1F and 2B,C). We conclude that the ability to induce sister chromatid splitting does not correlate with total CDK activity produced by the various CUP-CLB fusions. Furthermore, SPB separation and spindle formation are not sufficient to induce microtubule–kinetochore interactions. Events that can be triggered by Clb1 and Clb3, but not Clb4 are also necessary to promote attachments sufficient to generate tension. Determining why CLB4 expressing cells fail to form productive microtubule–kinetochore interactions could provide important insights into substrate specificity of cyclin-CDK complexes. To determine the consequences of premature cyclin expression on meiosis I chromosome segregation, we examined the segregation of heterozygous CENV-GFP dots in cells that were reversibly arrested in pachytene using the NDT80 block-release system. In this system, expression of NDT80 is controlled by the GAL1-10 promoter, which is regulated by an estrogen-inducible Gal4-ER fusion (Benjamin et al., 2003; Carlile and Amon, 2008). Cells were induced to sporulate and after 135 min, copper was added to induce cyclin expression. 4 hr 30 min after sporulation induction, estrogen was added to allow cells to synchronously proceed through the meiotic divisions. In wild-type, CUP-CLB4 and CUP-CLB5 cells, sister chromatids cosegregated in the first division, resulting in binucleate cells with a GFP dot in one of the two nuclei. In contrast, 39% of CUP-CLB1 and 41% of CUP-CLB3 cells segregated sister chromatids in the first division, as judged by the presence of binucleate cells with a GFP dot in each nucleus (Figure 2D). We observed a similar result for chromosome III and cells in which one copy of chromosome V was marked with a GFP dot and the other copy with an RFP dot (Figure 2—figure supplements 3 and 4). To confirm that sister chromatids indeed split during meiosis I in cells expressing CLB3 during prophase I, we examined when sister chromatid separation occurred with respect to Securin (Pds1 in budding yeast) degradation in CUP-CLB3 cells. In wild-type cells harboring heterozygous CENV-GFP dots, Pds1 degradation was immediately followed by movement of the single GFP dot to one side of the cell, indicating that homologous chromosomes had segregated. Subsequently, these cells underwent meiosis II and sister chromatids segregated (median = 86 min after Pds1 degradation; Figure 2E). In contrast, CUP-CLB3 cells segregated sister chromatids immediately after Pds1 degradation (median = 7 min after Pds1 degradation; Figure 2E). These results demonstrate that CUP-CLB3 cells segregate sister chromatids during the first meiotic division. Thus, CUP-CLB3 cells must be defective in two key aspects of meiosis I chromosome segregation: coorientation of sister kinetochores and maintenance of centromeric cohesion. We note that another essential aspect of meiosis I chromosome segregation, homologous recombination, was not affected by premature CLB3 expression. We observed no major defects in DSB formation, synaptonemal complex assembly and generation of recombination products, nor did preventing homologous recombination affect the phenotypes caused by premature CLB3 expression (Figure 2—figure supplements 5–8). The finding that CUP-CLB1 or CUP-CLB3 cells segregate sister chromatids during meiosis I indicates that sister kinetochore coorientation is defective. To investigate this further, we examined monopolin localization in cells that segregate sister chromatids in meiosis I (CUP-CLB3 cells) and cells that do not exhibit chromosome missegregation despite cyclin misexpression (CUP-CLB4 cells). Colocalization of Lrs4 or Mam1 with the kinetochore component Ndc10 was dramatically reduced in CUP-CLB3 but not CUP-CLB4 cells (Figure 3A and Figure 3—figure supplements 1 and 2). Hyperphosphorylation of Lrs4, which correlates with monopolin function (Clyne et al., 2003; Lee and Amon, 2003; Matos et al., 2008), was also significantly reduced in CUP-CLB3, but not in CUP-CLB4 cells (Figure 3B and Figure 3—figure supplement 3). These results indicate that premature expression of CLB3 prevents monopolin association with kinetochores. Premature CLB3 expression disrupts monopolin function. (A) Lrs4-13myc (green) localization relative to Ndc10-6HA (red) was determined in spread nuclei from wild-type (A9217), CUP-CLB3 (A26278) and CUP-CLB4 (A29643) harboring a Cdc20 depletion allele (cdc20-mn) were induced to undergo sporulation and arrested in metaphase I due to depletion of Cdc20. CuSO4 was added at 3 hr after induction of sporulation (n > 40). The fraction of spread nuclei that display colocalized, partial or mislocalized Lrs4 with respect to Ndc10 was compared to wild-type using a chi-square test (df 2): CUP-CLB4, χ2 = 1.136, p=0.5666; CUP-CLB3, χ2 = 45.84, p<0.0001. (B) Western blots for Lrs4-13myc, Clb3 and Pgk1 from wild-type (A9217) and CUP-CLB3 (A26278) cells. Cells were sporulated as described in (A). Sister chromatids segregate during meiosis I in CUP-CLB3 cells, indicating that centromeric cohesin either fails to associate with chromosomes or is lost prematurely. To test the first possibility, we examined chromosome association of the cohesin subunit Rec8 and the cohesion maintenance factor Pds5 with chromosomes. Chromatin immunoprecipitation (ChIP) and chromosome spreads revealed that association of both proteins with chromosomes in CUP-CLB3 cells was indistinguishable from that of wild-type cells during prophase I or metaphase I (Figure 4A and Figure 4—figure supplements 1 and 2). Thus, loading of cohesion factors onto chromosomes is not affected in CUP-CLB3 cells. CLB3 misexpression disrupts protection of centromeric cohesin. Cyclin expression was induced after 2 hr 15 min (C) and (D), 2 hr 30 min (A), (B), (E), (F) and (H) or 3 hr (G) and (I) of sporulation. (A) Chromosomal association of Rec8-13myc was monitored by ChIP-chip in wild-type (A28716) and CUP-CLB3 (A28718) during prophase I arrest. Centromere position is identified by a black circle. (B) Centromeric Rec8 localization was monitored in spread nuclei from wild-type (A28684), CUP-CLB3 (A28685) and CUP-CLB4 (A28686) cells carrying REC8-3HA (red) and NDC10-13myc (green) (n > 40). The fraction of spread nuclei that were Rec8 positive or negative was compared to wild-type using a chi-square test (df 1): CUP-CLB4, χ2 = 0.001323, p=0.9710; CUP-CLB3, χ2 = 32.79, p<0.0001. (C) Rec8 cleavage monitored by Western blot after release from an NDT80 block (4 hr 30 min) in wild-type and CUP-CLB3 carrying both a myc-tagged REC8 allele as well as either HA-tagged REC8 or rec8-29A allele (left to right: A29957, A29959, A29961, A29963). (D) Percentage of cells with short bipolar spindles was determined at indicated times in wild-type (A22804), CUP-CLB3 (A29965), rec8-29A (A22803) and CUP-CLB3 rec8-29A (A29967) after release from an NDT80 block (4 hr 30 min) (n = 100 per time point). (E) ChIP analysis for total Rec8, p-S179 Rec8 or p-S521 Rec8 from metaphase I-arrested (cdc20-mn) wild-type (A28681), CUP-CLB3 (A28682) and Sgo1-depleted (sgo1-mn; A29994) cells. Relative occupancy at a chromosome arm site (c194) or at a centromeric site (CENV) was determined relative to a low binding region (c281). Error bars represent range (n = 2). (F) Chromosomal association of Sgo1-3V5 was monitored by ChIP-chip in wild-type (A29795) and CUP-CLB3 (A29799) cells during prophase I-arrest. Centromere position is identified by a black circle. (G), (H) Localization of Sgo1-9myc (G, green) or Rts1-13myc (H, green) relative to Ndc10-6HA (red) determined by nuclear spreads in (G) wild-type (A22868) and CUP-CLB3 (A22870) or (H) wild-type (A28329) and CUP-CLB3 (A28330) during prophase I (n > 40). For (G), the fraction of spread nuclei that display colocalized or mislocalized Sgo1 relative to Ndc10 was compared between wild-type and CUP-CLB3 using a chi-square test (df 1) χ2 = 1.554, p=0.2125. For (H), the fraction of spread nuclei that display colocalized, partial or mislocalized Rts1 relative to Ndc10 was compared between wild-type and CUP-CLB3 using a chi-square test (df 2) χ2 = 3.712, p=0.1563. (I) Localization of Sgo1-9myc (green) in binucleates relative to Ndc10-6HA (red) determined by nuclear spreads from wild-type (A22868) and CUP-CLB3 (A22870) (n > 40). The fraction of spread nuclei that were Sgo1 positive or negative was compared between wild-type and CUP-CLB3 using a chi-square test (df 1) χ2 = 23.92, p<0.0001. To test the possibility that CUP-CLB3 cells fail to maintain centromeric cohesion beyond anaphase I, we first determined the localization of the cohesin subunit Rec8 in cells that had progressed past metaphase I. Rec8 colocalized with the kinetochore component Ndc10 in binucleate wild-type and CUP-CLB4 cells, demonstrating that centromeric cohesin is protected from removal until the onset of anaphase II. In contrast, Rec8 was not detected around centromeres in a substantial fraction of binucleate CUP-CLB3 cells (Figure 4B). Functional assays confirmed the defect in centromeric cohesion maintenance in CUP-CLB3 cells. Although mam1∆ cells biorient sister chromatids during meiosis I, they delay nuclear division until meiosis II due to the presence of centromeric cohesin (Toth et al., 2000; Rabitsch et al., 2003). The delay in nuclear division of a mam1∆ was partially alleviated by the expression of CUP-CLB3 (Figure 4—figure supplement 3). This partial effect is likely due to not all CUP-CLB3 cells losing centromeric cohesion prematurely in meiosis I (Figure 4B). We conclude that both centromeric and arm cohesin are lost from chromosomes at the onset of anaphase I in CUP-CLB3 cells. Next, we investigated the cause of premature centromeric cohesin removal in CUP-CLB3 cells. Cleavage of cohesin by separase requires the phosphorylation of Rec8 at multiple residues (Brar et al., 2006; Katis et al., 2010). A recessive allele of REC8 in which 29 in vivo phosphorylation sites were mutated to alanine (rec8-29A) (Brar et al., 2006) was not cleaved in CUP-CLB3 cells, but wild-type Rec8 was (Figure 4C and Figure 4—figure supplement 4). Furthermore, the rec8-29A allele caused a similar metaphase I delay in wild-type and CUP-CLB3 cells when expressed as the sole source of REC8 (Figure 4D and Figure 4—figure supplements 5 and 6). We noticed that the Rec8 cleavage product was detected at lower levels in CUP-CLB3 cells (Figure 4C and Figure 4—figure supplement 5). The cause of this reduction is currently unclear, but could indicate that in CUP-CLB3 cells, cohesin removal also relies on a separase-independent pathway, that is the prophase removal pathway (Yu and Koshland, 2005). 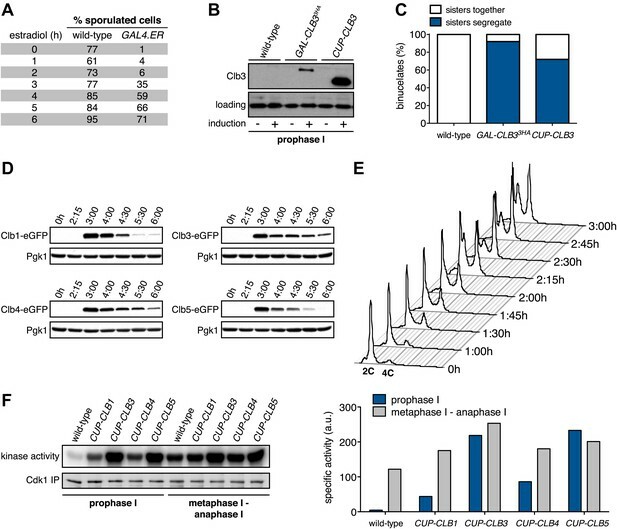 Our results demonstrate that Rec8 phosphorylation is required for cohesin removal in CUP-CLB3 cells and suggest that the defect in centromeric cohesin protection may result from increased phosphorylation of centromeric Rec8. To test this possibility, we used phospho-specific antibodies against two in vivo phosphorylation sites of Rec8 (pS179 and pS521) (Brar et al., 2006; Katis et al., 2010; M. Attner personal communication, October 2011) and analyzed the relative enrichment of total Rec8 and phospho-Rec8 at CENV or at an arm cohesin binding site by ChIP in metaphase I-arrested cells. The two phospho-specific antibodies immunoprecipitated similar amounts of Rec8 in wild-type and CUP-CLB3 cells at the arm site (Figure 4E), which is consistent with arm cohesin being primed for Separase cleavage. However, the amount of phosphorylated Rec8 was increased at the centromere in CUP-CLB3 cells compared to wild-type cells, albeit not to the same extent as in cells depleted for Sgo1 (sgo1-mn), in which meiosis I centromeric-cohesin protection is completely defective (Figure 4E). 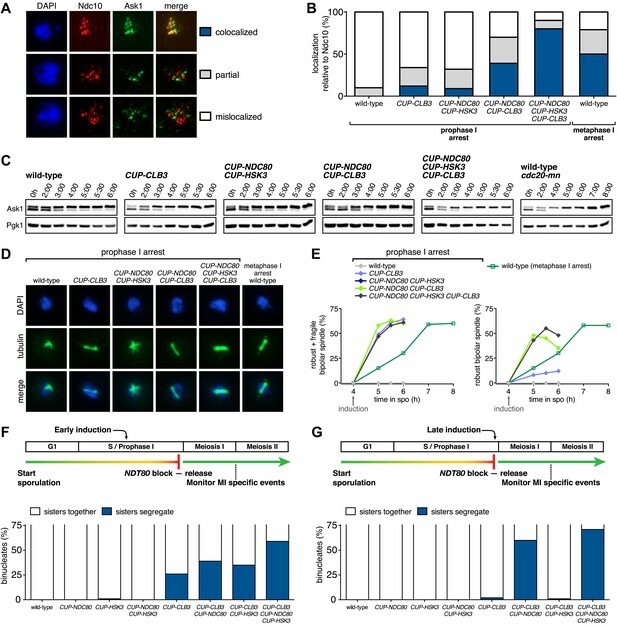 We conclude that CUP-CLB3 cells are compromised in preventing centromeric Rec8 phosphorylation during meiosis I.
Sgo1-PP2A and the meiosis-specific protein Spo13 prevent centromeric Rec8 phosphorylation during meiosis I to protect this cohesin pool from cleavage. All three proteins localize to kinetochores during meiosis I, which is thought to be critical for their cohesin-protective function (Katis et al., 2004a, 2004b; Kitajima et al., 2004; Lee et al., 2004; Kitajima et al., 2006; Riedel et al., 2006). Surprisingly, Sgo1, the PP2A regulatory subunit Rts1 and Spo13 localized normally in prophase I- and metaphase I-arrested CUP-CLB3 cells (Figure 4F–H and Figure 4—figure supplements 7–9). We noticed a moderate reduction of Sgo1 and Rts1 at centromeres in binucleate CUP-CLB3 cells (Figure 4I and Figure 4—figure supplement 10). However, this reduction during anaphase I is most likely a consequence rather than a cause of premature loss of centromeric cohesin. In cells expressing a phosphomimetic version of Rec8 (rec8-4D) that cannot be retained at centromeres beyond meiosis I, Rts1 localization is also reduced in anaphase I (Figure 4—figure supplement 11). It is thus unlikely that the reduction of Sgo1 and Rts1 at centromeres during anaphase I contributes to the premature loss of centromeric cohesin. These findings, together with our observation that centromeric Rec8 phosphorylation is increased in CUP-CLB3 cells, indicate that Sgo1-PP2A function, but not localization, is impaired in CUP-CLB3 cells. How does premature expression of CLB3 interfere with establishment of the meiosis I chromosome segregation pattern? The comparison of the effects caused by CLB3 and CLB4 misexpression provided insight into this question. Both cyclins induce spindle formation in prophase I. However, chromosomes are able to attach to this spindle and experience pulling forces only in CUP-CLB3 cells. Thus, the ability to form tension-generating attachments (i.e. CUP-CLB1 or CUP-CLB3 cells) correlates with defects in meiosis I chromosome morphogenesis and segregation. This correlation suggests that premature microtubule–kinetochore engagement during premeiotic S phase/early prophase I is the underlying cause of chromosome missegregation in CUP-CLB3 cells and predicts that tension generating microtubule–kinetochore attachments should inhibit meiosis I chromosome morphogenesis. Conversely, preventing them should enable building a proper meiosis I chromosome architecture. We tested the first prediction using a previously described method in which monopolin-dependent sister kinetochore coorientation is induced during mitosis (Monje-Casas et al., 2007). Overexpression of MAM1 and CDC5 upon a pheromone-induced G1 arrest is sufficient to induce cosegregation of sister chromatids in mitotic anaphase (Monje-Casas et al., 2007, Figure 5A). However, when cells are allowed to form microtubule–kinetochore attachments prior to CDC5 and MAM1 expression, cosegregation of sister chromatids is prevented. We reversibly arrested cells in metaphase using a methionine repressible CDC20 allele (MET-CDC20) and induced MAM1 and CDC5 expression after cells had arrested in metaphase and had formed microtubule–kinetochore interactions. Under these conditions, MAM1 and CDC5 expression did not induce sister chromatid cosegregation when cells were released into anaphase (Figure 5A). Importantly, disrupting microtubule–kinetochore interactions by depolymerizing microtubules with nocodazole during the metaphase arrest resulted in robust cosegregation of sister chromatids in anaphase (48% cosegregation, Figure 5A). These results show that microtubule–kinetochore interactions modulate the ability of monopolin to induce sister chromatid cosegregation. Transient disruption of microtubule–kinetochore interactions suppresses the chromosome segregation defects in CUP-CLB3 cells. (A) Wild-type (A10684) and GAL-CDC5 GAL-MAM1 (A26546) cells, carrying a MET-CDC20 allele and CENIV-GFP dots, were monitored for chromosome segregation in anaphase (see ‘Materials and methods’ for details). MT = microtubule, KT = kinetochore, (n = 100). The fraction of anaphase cells that segregate or cosegregate sister chromatids was compared between GAL-CDC5 GAL-MAM1 condition (2) and GAL-CDC5 GAL-MAM1 condition (3) using a chi-square test (df 1) χ2 = 59.71, p<0.0001. (B) Schematic description of the experimental regime used for (C) through (H) see ‘Materials and methods’ for details. (C) Localization of Lrs4-13myc (green) in mononucleates relative to Ndc10-6HA (red) determined by nuclear spreads (n > 40) and (D) phosphorylation of Lrs4-13myc determined by gel mobility shift in wild-type (A29612), ndc80-1 (A29614), CUP-CLB3 (A29616) and CUP-CLB3 ndc80-1 (A29618). For (C), using a chi-square test (df 2) the fraction of spread nuclei that display colocalized, partial or mislocalized Lrs4 with respect to Ndc10 was compared between wild-type and ndc80-1 χ2 = 0.9668, p=0.6167 and between CUP-CLB3 and CUP-CLB3 ndc80-1 χ2 = 56.34, p<0.0001. (E) Localization of Rec8-13myc (green) in binucleates relative to Ndc10-6HA (red) determined by nuclear spreads in wild-type (A28716), ndc80-1 (A28720), CUP-CLB3 (A28718) and CUP-CLB3 ndc80-1 (A28722) (n > 40). Using a chi-square test (df 1) the fraction of spread nuclei that were Rec8 positive or negative was compared between wild-type and ndc80-1 χ2 = 1.185, p=0.2764 and between CUP-CLB3 and CUP-CLB3 ndc80-1 χ2 = 23.96, p<0.0001. (F) Segregation of sister chromatids using heterozygous CENV-GFP dots quantified in binucleates (n = 100) and (G) spore viability from wild-type (A22678), ndc80-1 (A28621), CUP-CLB3 (A22702) and CUP-CLB3 ndc80-1 (A28623) (n = 40 tetrads for wild-type and ndc80-1, n > 60 tetrads for CUP-CLB3 and CUP-CLB3 ndc80-1) (nonpermissive temperature >36°C). Using a chi-square test (df 1) the fraction of binucleates with a reductional or equational division was compared between CUP-CLB3 and CUP-CLB3 ndc80-1 χ2 = 24.18, p<0.0001. (G) Segregation of chromosome V using homozygous CENV-GFP dots quantified in tetranucleates from wild-type (A22688), ndc80-1 (A28625), CUP-CLB3 (A22708) and CUP-CLB3 ndc80-1 (A28627). Top panel: cells kept at 25°C for the duration of the experiment. Bottom panel: Cells treated as in (B) but monitored after meiosis II (n = 100). If the defects in sister kinetochore coorientation and centromeric cohesin maintenance of CUP-CLB3 cells are caused by premature microtubule–kinetochore interactions, proper meiosis I chromosome morphogenesis should be restored by transiently disrupting microtubule–kinetochore interactions. To test this, we used a temperature sensitive allele of NDC80 (ndc80-1), which encodes a component of the outer kinetochore. ndc80-1 cells grow and sporulate normally at 25°C, but fail to undergo any nuclear divisions at temperatures above 34°C (Figure 5—figure supplement 1). We first asked whether disrupting microtubule–kinetochore interactions suppresses the kinetochore localization defect of monopolin in CUP-CLB3 cells. Using the NDT80 block-release system, we induced cells to sporulate at 25°C. After 165 min, we induced cyclin expression and concurrently transferred cells to 34°C to inactivate the ndc80-1 allele. Cells were then incubated for an additional 135 min to arrest them in the NDT80-depletion block. We then transferred cells to the permissive temperature and released them from the NDT80 block into a metaphase I-arrest by depleting CDC20 (cdc20-mn) (Figure 5B). 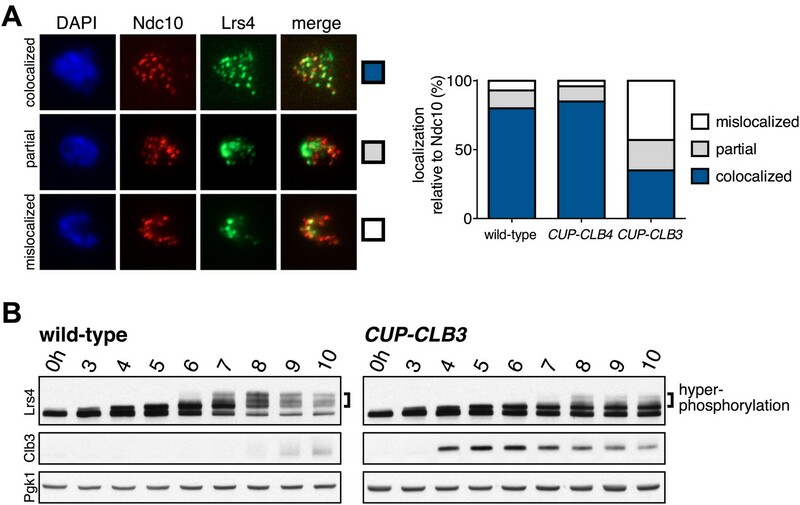 Under these conditions, wild-type and ndc80-1 cells arrested in metaphase I with the monopolin subunit Lrs4 localized to kinetochores, while CUP-CLB3 cells showed a defect in Lrs4 localization (Figure 5C). Remarkably, CUP-CLB3 ndc80-1 cells showed near wild-type levels of Lrs4 association with kinetochores (Figure 5C). Transient inactivation of Ndc80 also restored Lrs4 phosphorylation in CUP-CLB3 cells (Figure 5D). Our results demonstrate that premature microtubule–kinetochore interactions prevent sister kinetochore coorientation by disrupting proper localization of the monopolin complex. The finding that transient disruption of microtubule–kinetochore interactions also suppresses the Lrs4 phosphorylation defect of CUP-CLB3 cells, furthermore suggests that Lrs4 hyperphosphorylation occurs not at the time of nucleolar release, but once Lrs4 localizes to kinetochores. We next asked whether transient inactivation of microtubule–kinetochore interactions also suppresses the premature loss of centromeric cohesin observed in CUP-CLB3 cells. We used a similar protocol to the one described above, except cells were not arrested in metaphase I following release from the NDT80 block, but were allowed to proceed into anaphase I to examine Rec8 localization. Remarkably, disrupting microtubule–kinetochore interactions at the time of Clb3 expression caused a considerable increase in the percentage of CUP-CLB3 cells that retained Rec8 around centromeres during anaphase I (Figure 5E). Finally, restoring centromeric cohesin protection and sister kinetochore coorientation to CUP-CLB3 cells by transient inactivation of Ndc80 restored homolog segregation during meiosis I (Figure 5F and Figure 5—figure supplements 2–4). Similar results were obtained with a temperature sensitive allele of the gene encoding the outer kinetochore component Dam1 (dam1-1) or by disrupting microtubule–kinetochore interactions by benomyl treatment (Figure 5—figure supplements 5 and 6). We further observed a striking improvement in overall chromosome segregation and spore viability in CUP-CLB3 ndc80-1 compared to CUP-CLB3 cells (Figure 5G,H). The suppression of chromosome missegregation in CUP-CLB3 ndc80-1 cells did not depend on the spindle assembly checkpoint, because deletion of MAD3 had no discernable effect on the extent of ndc80-1 mediated suppression (Figure 5—figure supplements 7 and 8), nor was it due to the ndc80-1 allele lowering Clb3-CDK activity (Figure 5—figure supplement 9). In summary, our results demonstrate that the defects associated with CUP-CLB3 cells are due to premature microtubule–kinetochore interactions. Our results further suggest that preventing microtubule–kinetochore interactions during premeiotic S phase and prophase I is necessary to establish a meiosis I-specific chromosome architecture. Our results demonstrate that preventing premature interactions of microtubules with kinetochores is essential for establishing a meiosis I chromosome architecture. This occurs, at least in part, by restricting Clb-CDK activity during premeiotic S phase and prophase I. Are additional mechanisms in place to prevent premature microtubule–kinetochore interactions? Insight into this question came from the variability in CUP-CLB3-associated phenotypes. We initially noticed that the timing of CLB3 induction had an impact on the extent of sister chromatid segregation in meiosis I, especially in experiments that employed the NDT80 block-release system. To investigate this further, we expressed CLB3 at different times after induction of sporulation. We observed that the extent of meiosis I sister chromatid segregation declined as CLB3 was expressed later during the NDT80 block (Figure 6A). One possibility is that CLB3-induced sister chromatid segregation depends on additional factors that become limiting. Kinetochore components are good candidates for such additional factors, because previous studies in fission yeast demonstrated that a subset of outer kinetochore components dissociates from the kinetochore during prophase I (Asakawa et al., 2005). Meiosis I sister chromatid segregation correlates with presence of outer kinetochore components. (A) Schematic description of the experimental regime and segregation of sister chromatids using heterozygous CENV-GFP dots quantified in binucleates from wild-type (A22678) and CUP-CLB3 (A29406) after cyclin induction at 2 hr 15 min, 3 hr, 4 hr and 4 hr 30 min post transfer to sporulation medium. Cells released from NDT80-block at 4 hr 30 min (n = 100). Using a chi-square test (df 1), the fraction of binucleates that display a reductional or equational division was compared between wild-type and CUP-CLB3 for each induction time point: (2:15), χ2 = 58.00, p<0.0001; (3:00), χ2 = 14.46, p=0.0001; (4:00), χ2 = 1.020, p=0.3124; (4:30), χ2 = 0.3384, p=0.5607. (B) Cluster analysis of kinetochore components from the indicated time points. Further details are in the ‘Materials and methods’ and in Brar et al. (2012). Inner kinetochore = Cse4 nucleosomes, Cbf3, Ctf19 complexes and Mif2. Outer kinetochore = Spc105, Mis12, Ndc80 and DASH complexes. Fold induction is calculated by dividing the average expression from metaphase I—anaphase I by the average expression from DNA replication-prophase I. (C) Ordered plot for mRNA-seq and ribosome footprinting data for NDC80 and (D) HSK3 at the indicated stages. Dotted line indicates time of release from NDT80 block. Further details are in the ‘Materials and methods’ and in Brar et al. (2012). (E) Western blot for Ndc80-3V5 and Pgk1 from A30340 cells and (F) Hsk3-3V5 and Pgk1 from A31861 cells. Cells induced to sporulate and released from NDT80 block at 4 hr 30 min. Using a high-resolution ribosome profiling dataset (Brar et al., 2012), we examined the timing of synthesis of all kinetochore components during meiotic progression by cluster analysis. This analysis revealed two major expression classes, one included kinetochore components that peak in expression prior to or during prophase I (early class), and the other contained components that instead show peak expression during the meiotic divisions (late class). The early class was enriched for inner kinetochore components (16 of 23), while the late class included primarily outer kinetochore components (13 of 18) (Figure 6B, Figure 6—figure supplements 1–10). The inner kinetochore binds to the centromere and generates a platform for the assembly of the outer kinetochore, which mediates microtubule attachments (Tanaka, 2010). The temporal difference in expression suggests that the inner kinetochore is assembled prior to the meiotic divisions, while the outer kinetochore is constructed only as cells enter the meiotic divisions. Among the outer kinetochore components that displayed peak synthesis during the divisions, NDC80 and a subunit of the DASH complex, HSK3, displayed the most differential expression prior to meiosis I and during meiosis I, with a 9.02 and 2.64-fold induction, respectively (Figure 6B–D). This decline in Ndc80 expression is consistent with a previous study in fission yeast, showing that Ndc80 becomes undetectable at kinetochores during prophase I (Asakawa et al., 2005). Analysis of Ndc80 protein levels provided an explanation for why cells upregulate the synthesis of outer kinetochore components during entry into meiosis I. Ndc80 levels declined during premeiotic S phase and became undetectable during late prophase I (Figure 6E). 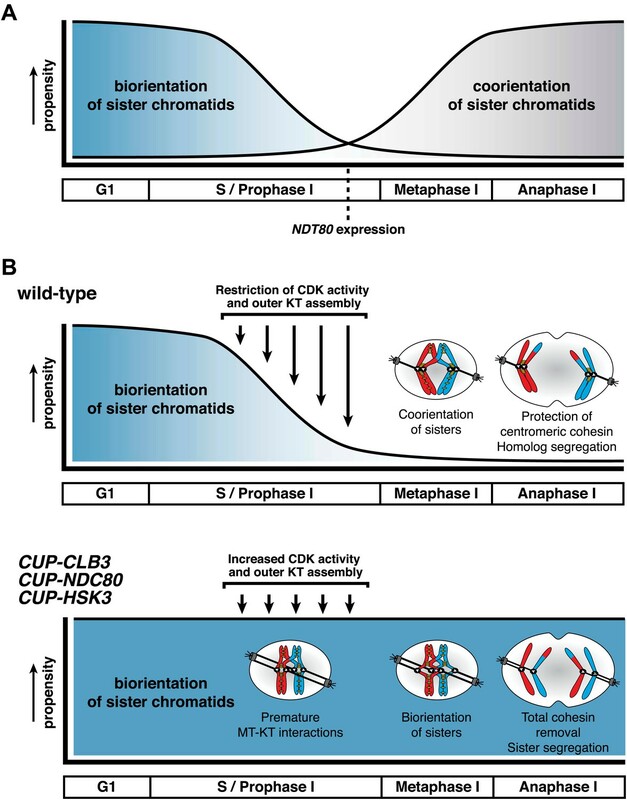 Importantly, the ability of CUP-CLB3 to induce sister-chromatid segregation during meiosis I tightly correlated with Ndc80 protein levels; as Ndc80 protein declines, so does CLB3-induced meiosis I sister chromatid segregation (compare Figure 6A,E). Hsk3 protein levels were also low until meiosis I entry (Figure 6F), but not all outer kinetochore components exhibited this decline in protein levels. For example, Ask1, a subunit of the DASH complex, was present throughout prophase I and levels of another DASH complex component, Dam1, increased during prophase I (Figure 6—figure supplement 11). Our findings indicate that the assembly of the outer kinetochore is restricted prior to NDT80 expression and pachytene exit due to low levels of a subset of outer kinetochore components. To determine whether reduced expression of the outer kinetochore components Ndc80 and Hsk3 contributes to preventing premature microtubule–kinetochore engagement, we examined the consequences of expressing the two genes from the CUP1 promoter (Figure 7). We first assessed whether expression of the two proteins allows for the recruitment of the DASH complex to kinetochores, which occurs via delivery through microtubules and can thus be used as a means of assessing end-on attachment of kinetochores (Cheeseman et al., 2001; Tanaka, 2010). Cells were induced to sporulate and after 4 hr, a time when Ndc80 levels are normally diminished, we induced the expression of CLB3, NDC80 and/or HSK3. Whereas expression of either gene alone caused only a few cells to recruit Ask1 to kinetochores, cells simultaneously expressing NDC80, HSK3 and CLB3 during prophase I showed colocalization between Ask1 and the inner kinetochore component Ndc10, to an equal or greater extent than what was observed in metaphase I-arrested wild-type cells (Figure 8A,B). The difference in Ask1 localization was not due to a difference in ASK1 expression (Figure 8C). In addition, induction of CLB3 under the conditions mentioned above gave rise to bipolar spindles that appeared fragile with a weakened midzone. In contrast, consistent with stable microtubule–kinetochore interactions, coexpression of CLB3, HSK3 and NDC80 resulted in the formation of robust bipolar spindles (Figure 8D,E). Importantly, the expression of NDC80 and/or HSK3 during an NDT80 block caused a considerable increase in meiosis I sister chromatid segregation in CUP-CLB3 cells (Figure 8F). Furthermore, under conditions in which CLB3 expression alone failed to induce meiosis I sister chromatid segregation, expression of CLB3 together with NDC80 and HSK3 caused a substantial increase in meiosis I sister chromatid segregation (Figure 8G). This occurred even when cells were maintained in a prolonged NDT80 block prior to expression of CLB3, NDC80 and HSK3 (Figure 9), ruling out the possibility that the expression of NDT80 targets, such as CDC5, early during sporulation contributes to sister chromatid segregation during meiosis I. We conclude that limiting outer kinetochore assembly is an additional mechanism to prevent microtubule–kinetochore interactions during premeiotic S phase and prophase I. 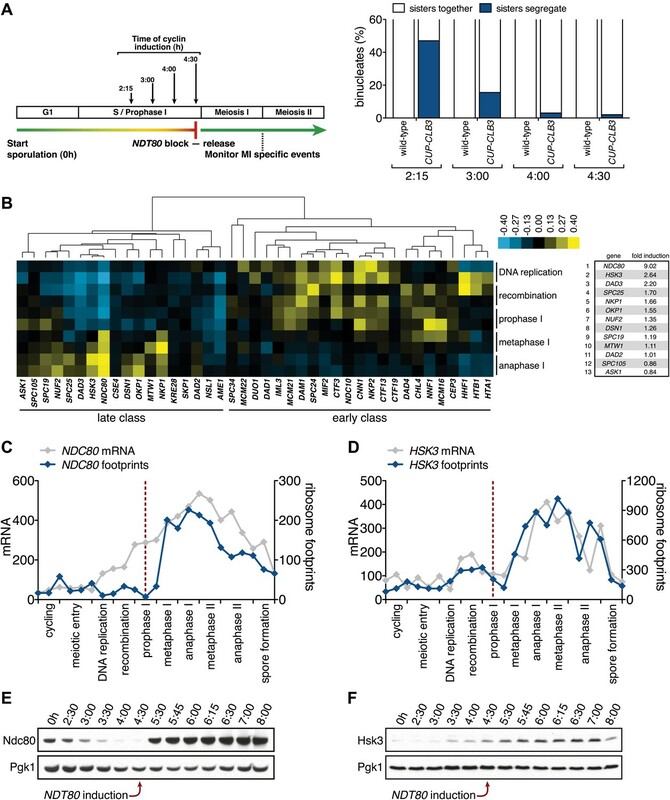 Characterization of NDC80 and HSK3 overexpression. (A) CUP-NDC80-3V5 (A30342) and CUP-HSK3-3HA (A32060) cells also carrying the GAL4-ER and GAL-NDT80 fusions were induced to sporulate. After 2 hr 30 min CuSO4 (50 μM) was added and cells were subsequently released from NDT80 block 4 hr 30 min after transfer into sporulation medium. The levels of Ndc80-3V5, Hsk3-3HA and Pgk1 were monitored by Western blot. (B) CUP-NDC80-3V5 CUP-CLB3 (A31949), CUP-NDC80-3V5 CUP-HSK3 (A31951) and CUP-NDC80-3V5 CUP-HSK3 CUP-CLB3 (A31953) cells were induced to sporulate. 4 hr after transfer into sporulation medium CuSO4 (50 μM) was added, and localization of Ndc80-3V5 (green) relative to Ndc10-6HA (red) was determined by nuclear spreads 5 hr after transfer into sporulation medium. Expression of NDC80 and HSK3 in prophase I enhances Clb3-CDK-induced meiosis I sister chromatid segregation. For (A)–(E), wild-type (A31945), CUP-CLB3 (A31947), CUP-NDC80 CUP-HSK3 (A31951), CUP-NDC80 CUP-CLB3 (A31949), CUP-NDC80 CUP-HSK3 CUP-CLB3 (A31953) and cdc20-mn (A31955) cells were induced to sporulate and CuSO4 (50 μM) was added at 4 hr after sporulation induction. (A) Representative images and (B) quantification of Ask1-13myc (green) in mononucleates relative to Ndc10-6HA (red) determined by nuclear spreads prepared after 1 hr of CuSO4 induction (n > 40 except for A31955 [n = 28]). For (B), using a chi-square test (df 2) the fraction of spread nuclei that display colocalized, partial or mislocalized Ask1 with respect to Ndc10 was compared between CUP-CLB3 and CUP-CLB3 CUP-NDC80 CUP-HSK3 χ2 = 51.49, p<0.0001. (C) Western blots of Ask1-13myc and Pgk1. (D) Bipolar spindle morphology and (E) left panel, total (robust + fragile) bipolar spindle formation, and right panel, robust bipolar spindle formation determined at the indicated time points (see ‘Materials and methods’ for further description) (n = 100 per time point). Note: CUP-NDC80 CUP-HSK3 (dark blue) data points occluded by wild-type (grey) data points. 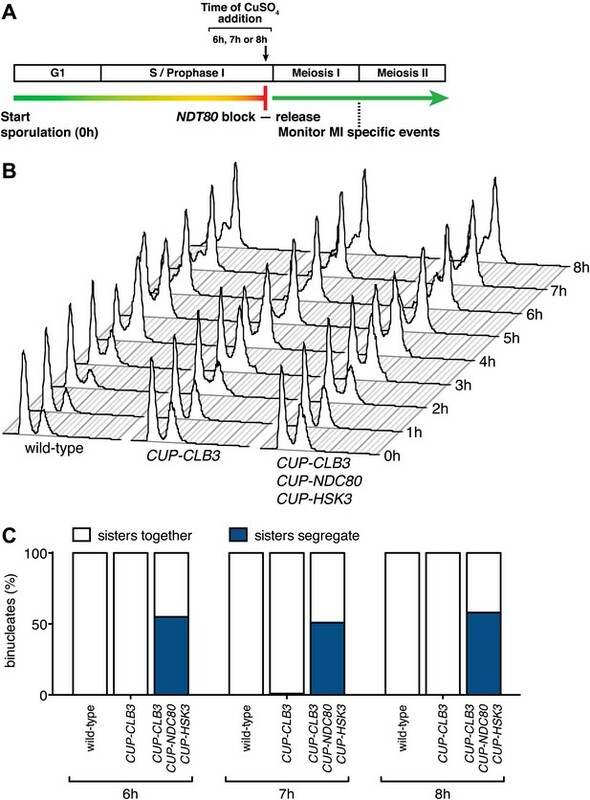 (F), (G) Segregation of sister chromatids using heterozygous CENV-GFP dots quantified in binucleates from wild-type (A30340), CUP-NDC80 (A30342), CUP-HSK3 (A31849), CUP-NDC80 CUP-HSK3 (A31855), CUP-CLB3 (A31847), CUP-CLB3 CUP-NDC80 (A31853), CUP-CLB3 CUP-HSK3 (A31851) and CUP-CLB3 CUP-NDC80 CUP-HSK3 (A31857) (early induction = 2:15 hr, late induction= 4:30 hr after induction of sporulation; release from NDT80 block at 4:30 hr) (n = 100). For (F), using a chi-square test (df 1) the fraction of binucleates with a reductional or equational division was compared between CUP-CLB3 and CUP-CLB3 CUP-NDC80 CUP-HSK3 χ2 = 22.28, p<0.0001. For (G), using a chi-square test (df 1) the fraction of binucleates with a reductional or equational division was compared between CUP-CLB3 and CUP-CLB3 CUP-NDC80 CUP-HSK3 χ2 = 102.7, p<0.0001. CUP-CLB3 CUP-NDC80 CUP-HSK3-induced meiosis I sister chromatid segregation is independent of the length of the prophase I arrest. (A) Schematic description of the experimental regime used in (B) and (C). (B), (C) Wild-type (A22678), CUP-CLB3 (A22702) and CUP-CLB3 CUP-NDC80 CUP-HSK3 (A31857) cells also carrying the GAL4-ER and GAL-NDT80 fusions were induced to sporulate. Cells were released from the NDT80 block and concurrently pCUP1-dependent expression was induced at either 6 hr, 7 hr or 8 hr post transfer to sporulation medium (by addition of 1 μM estradiol and 50 μM CuSO4 respectively). Samples were taken at the indicated time points to determine DNA content (B) and the percentage of binucleate cells with segregated sister chromatids (C). For (C), using a chi-square test (df 1), the fraction of binucleates that display a reductional or equational division in CUP-CLB3 CUP-NDC80 CUP-HSK3 cells was compared between 6 hr and 7 hr induction χ2 = 0.3212, p=0.5709 and between 6 hr and 8 hr induction χ2 = 0.1831, p=0.6687. The specialized chromosome segregation pattern in meiosis likely evolved through modifications of the mitotic cell division program. We find that preventing microtubule–kinetochore interactions during premeiotic S phase and prophase I is essential for transforming mitosis into meiosis I. Meiosis I chromosome morphogenesis, including the assembly of cohesin protective structures around centromeres and sister kinetochore coorientation, occurs during prophase I. We propose that when microtubules interact with kinetochores prior to completion of this remodeling process, they establish a default attachment, biorientation, which is incompatible with establishing sister kinetochore coorientation and a cohesin protective domain around centromeres (Figure 10). Our findings reveal a novel regulatory event that is essential for accurate meiosis I chromosome segregation and demonstrate that temporal restriction of microtubule–kinetochore interactions is instrumental in transforming mitosis into meiosis. Model for temporal regulation of microtubule–kinetochore interactions during meiosis. (A) As prophase I progresses, the propensity of sister chromatids to biorient decreases and the ability to coorient sister chromatids increases. (B) Top panel: inhibiting Clb-CDK activity and outer kinetochore (KT) assembly during prophase I establishes a meiosis I-specific chromosome segregation pattern by allowing sister kinetochore coorientation and protection of centromeric cohesin. Bottom panel: disrupting the regulation of microtubule–kinetochore (MT–KT) interactions causes sister chromatid segregation in meiosis I.
Transcriptional and translational controls restrict CLB3 expression to meiosis II (Carlile and Amon, 2008). Eliminating both, by placing the gene under the control of the GAL1-10 promoter or the CUP1 promoter has dramatic effects on meiosis I chromosome segregation. CLB3 expression from the GAL1-10 promoter, which leads to Clb3 levels comparable to those seen for wild-type cells in meiosis II, causes a significant suppression of the meiosis I chromosome segregation pattern. This defect is not further enhanced by overexpression of the protein (by expression from the CUP1 promoter), which further indicates that this phenotype does not emanate from expressing exceedingly high levels of the cyclin, but is a consequence of premature expression. The consequences of premature CLB3 expression are dramatic. It leads to premature microtubule–kinetochore interactions and prevents coorientation factors from associating with kinetochores. The observation that the transient disruption of microtubule–kinetochore interactions, either by inactivating the outer kinetochore or by microtubule depolymerization, allowed coorientation factors to associate with kinetochores, despite CLB3 misexpression, led us to conclude that it is premature microtubule–kinetochore interactions that interfere with the establishment of sister kinetochore coorientation during meiosis I. It is currently unclear how preexisting microtubule–kinetochore interactions prevent monopolin association with kinetochores. Precocious attachment of microtubules to kinetochores could occlude the monopolin complex from binding to kinetochores. Alternatively, tension between sister kinetochores generated from stable microtubule–kinetochore interactions could induce a conformational change at the kinetochore and/or pericentric chromatin such that coorientation factors can no longer associate with the kinetochore. In addition to preventing sister kinetochore coorientation, premature expression of CLB3 interferes with protecting centromeric cohesin from removal during meiosis I. The same logic as outlined for coorientation factors applies to the conclusion that it is Clb3-CDK mediated premature microtubule–kinetochore interactions that lead to loss of centromeric cohesin protection in CUP-CLB3 cells; disrupting microtubule–kinetochore interactions by various means restores stepwise loss of cohesin in CUP-CLB3 cells. A simple interpretation of this result is that the centromeric-cohesin protective domain can be disrupted by tension between sister kinetochores at any meiotic stage prior to anaphase I. This does not appear to be the case. In cells lacking the coorientation factor MAM1, sister kinetochores come under tension in metaphase I, yet in these cells centromeric cohesin is not removed prematurely (Toth et al., 2000 and Figure 4—figure supplement 3). Thus, the timing of microtubule–kinetochore interactions is of importance. It is tempting to speculate that the establishment of the centromeric-cohesin protective domain, which occurs during prophase I or perhaps even earlier, is sensitive to premature microtubule–kinetochore interactions and/or tension that promote biorientation of sister kinetochores. However, once this domain is established, its maintenance during meiosis I can no longer be disrupted by tension between sister kinetochores. How premature microtubule–kinetochore interactions affect the centromeric cohesin protection machinery is not yet known. A defect in localization of the protective machinery to kinetochores does not appear to be the cause of this defect. Sgo1 and PP2A localize normally to kinetochores in CUP-CLB3 cells. Therefore, lack of cohesin protection upon premature microtubule–kinetochore engagement must either result from a defect in an unknown cohesin protection pathway or from a decrease in the activity of Sgo1 and/or PP2A. Premature association of kinetochores with microtubules could result in the untimely recruitment of a factor (e.g. Clb-CDKs themselves) to the pericentromere that inhibits the cohesin protective machinery. Alternatively, microtubule–kinetochore engagement could directly affect the activity of the protective machinery. Two mechanisms have been previously proposed whereby tension modulates the activity of the cohesin protective machinery. In mammalian cells, tension spatially separates centromeric cohesin from Sgo1-PP2A, perhaps leading to loss of protection (Lee et al., 2008). Tension has also been proposed to cause a deformation in PP2A, thus inhibiting its catalytic activity (Grinthal et al., 2010). Irrespective of whether it is tension-dependent perturbation of Sgo1-PP2A and/or recruitment of inhibitory factors, it is clear that premature microtubule–kinetochore engagement is a bona fide modulator of the cohesin protective machinery. Cyclin-CDKs regulate multiple aspects of microtubule–kinetochore dynamics. Cyclin-CDKs promote centrosome separation and bipolar spindle assembly (Fitch et al., 1992), kinetochore maturation (Holt et al., 2009) and chromosomal passenger complex localization (Tsukahara et al., 2010). Given the importance of preventing premature microtubule–kinetochore engagement to meiosis I chromosome morphogenesis, it is not surprising that cyclin-CDK activity is regulated at multiple levels in budding yeast; transcription of CLB1, CLB3 and CLB4 is not activated until cells exit pachytene (Chu and Herskowitz, 1998) and CLB3 translation is restricted to meiosis II (Carlile and Amon, 2008). Cyclin-CDK activity is also tightly regulated in other eukaryotes. Metazoan oocytes arrest for an extended period of time in prophase I. Multiple mechanisms keep cyclin-CDK activity low to maintain this arrest (reviewed in Von Stetina and Orr-Weaver, 2011). Similar regulation is observed in D. melanogaster and C. elegans. Remarkably, inappropriate activation of Cyclin A or cyclin E during prophase I in fruit flies and worms, respectively, results in a mitosis-like division (Sugimura and Lilly, 2006; Biedermann et al., 2009). Thus, restricting cyclin-CDK activity during premeiotic S phase and prophase I also appears to be required to establish a meiosis I-specific chromosome architecture in higher eukaryotes. Restriction of cyclin-CDK activity during premeiotic S phase and prophase I appears to be the major mechanism preventing premature microtubule–kinetochore interactions, but our data indicate that regulation of outer kinetochore assembly serves as an additional mechanism to prevent this from occurring. CUP-CLB3 can only induce meiosis I sister chromatid segregation when expressed during premeiotic S phase/early prophase I, but fails to do so when expressed during late prophase I. This difference is likely due to the outer kinetochore being present only until early prophase I. When Ndc80, Hsk3 and Clb3 are coexpressed during late prophase I, sister chromatid segregation occurs in meiosis I. This result demonstrates that the presence of Clb3-CDKs alone during late prophase I is not sufficient to cause meiosis I sister chromatid segregation but that outer kinetochore components must also be expressed. Whether outer kinetochore disassembly solely occurs to prevent microtubule kinetochore interactions remains to be determined. Outer kinetochore disassembly could also serve additional purposes during prophase I such as enabling telomere-mediated chromosome movements. Further study of the kinetochore assembly/disassembly cycle during meiosis will provide insights into the full impact of kinetochore regulation on meiotic chromosome segregation. In budding yeast, two essential components of the outer kinetochore, Ndc80 and Hsk3, are downregulated during prophase I. In S. pombe, Ndc80 and its binding partner Nuf2 dissociate from kinetochores in prophase I (Asakawa et al., 2005) raising the interesting possibility that deconstruction of the outer kinetochore is a conserved feature of meiotic prophase I. This dissociation depends on the mating pheromone signaling pathway (Asakawa et al., 2005). Intriguingly, ectopic induction of meiosis without mating pheromone signaling (i.e. in pat1 mutants), results in segregation of sister chromatids instead of homologous chromosomes in meiosis I (Yamamoto and Hiraoka, 2003; Yamamoto et al., 2004). Perhaps this change in the pattern of chromosome segregation in pat1 mutants arises from premature microtubule–kinetochore interactions due to a defect in outer kinetochore disassembly. Interestingly, in mouse oocytes, the Ndc80 complex is recruited to chromosomes only after nuclear envelope breakdown (Sun et al., 2011), raising the possibility that outer kinetochore assembly is also prevented in meiotic prophase I in vertebrates. Proper segregation of the genome during gametogenesis is critical for the proliferation of sexually reproducing species. Errors in chromosome segregation during meiosis result in aneuploidy, the leading cause of birth defects and miscarriages in humans (Hassold and Hunt, 2001). Thus, it is crucial to understand how accurate meiotic chromosome segregation is achieved. We discovered that the establishment of a meiosis-specific chromosome segregation pattern depends on the regulation of microtubule–kinetochore interactions. This is achieved by regulating cyclin-CDK activity as well as assembly of the outer kinetochore. There is evidence for similar regulatory events across different organisms (Asakawa et al., 2005; Sugimura and Lilly, 2006; Biedermann et al., 2009; Von Stetina and Orr-Weaver, 2011), suggesting that temporal restriction of microtubule-kinetochore interactions is an evolutionarily conserved event required to execute proper meiotic chromosome segregation. Strains used in this study are described in Supplementary file 1 and are derivatives of SK1 (all meiosis experiments) or W303 (Figure 5A). GAL-NDT80 and GAL4-ER constructs are described in Benjamin et al. (2003). CUP-CLB1, CUP-CLB3, CUP-CLB4, CUP-CLB5, SPC42-mCherry, SGO1-3V5, RTS1-13myc, RTS1-3V5, HSK3-3V5, NDC80-3V5, ASK1-13myc, CUP-NDC80-3V5, CUP-HSK3, mam1∆, SPO13-3V5, mad3∆, DAM1-3V5, CUP-HSK3-3HA were constructed by PCR-based methods described in Longtine et al. (1998). Primer sequences for strain constructions are available upon request. ndc80-1 and dam1-1 are described in Wigge et al. (1998); Jones et al. (1999) and SK1 strains carrying these alleles were constructed via backcrossing (>9X). CENV-LacO was constructed by cloning a CENV homology region with XhoI restriction sites into the SalI cut plasmid pCM40 (gift from Doug Koshland) and integrated near CDEIII (<1 kb) by BamHI digest. pHG40 carrying CUP1 promoter was a gift from Hong-Guo Yu. 3V5 tagging plasmids were provided by Vincent Guacci. Strains were grown to saturation in YPD at room temperature, diluted in BYTA (1% yeast extract, 2% tryptone, 1% potassium acetate, 50 mM potassium phthalate) to OD600 = 0.25, and grown overnight at 30°C (room temperature for ndc80-1 and dam1-1 experiments). Cells were resuspended in sporulation medium (0.3% potassium acetate [pH 7], 0.02% raffinose) to OD600 = 1.85 and sporulated at 30°C unless otherwise indicated. GAL-NDT80 GAL4-ER strains were released from the NDT80 block by the addition of 1 μM β-estradiol (5 mM stock in ethanol; Sigma E2758-1G, St. Louis, MO) at 4 hr 30 min unless otherwise indicated. Note: strains released from NDT80 block at 4 hr 30 min are prototrophic and have accelerated meiotic kinetics relative to strains containing auxotrophies. Strains with CUP1 promoter driven alleles were induced by addition of CuSO4 (50 μM final concentration; 100 mM stock made from anhydrous powder [FW = 159.6 g/mol]; Mallinckrodt, Hazelwood, MO) at indicated times. Wild-type, ndc80-1 or dam1-1 cells carrying GAL-NDT80 GAL4-ER were induced to sporulate at room temperature (permissive temperature). After 2 hr 45 min, cyclin expression was induced by addition of 50 μM CuSO4 and cells were concurrently shifted to the semi-permissive (34°C) or non-permissive (>35.5°C) temperature and allowed to arrest in pachytene. Cells were then transferred to the permissive temperature and released from the NDT80 block by addition of 1 μM β-estradiol into either a metaphase I arrest (by depleting Cdc20) or allowed to proceed through the meiotic divisions. Wild-type or CUP-CLB3 cells carrying the GAL-NDT80 GAL4-ER constructs were induced to sporulate at 30°C. 2 hr 15 min after transfer into sporulation medium, cells were filtered and transferred to medium containing CuSO4 (50 μM) and either 0.4% DMSO or benomyl (120 μg/ml). After an additional 2 hr 15 min incubation, benomyl was washed out by filtering and washing cells with 10 volumes of sterile dH20 containing 0.4% DMSO. Cells were subsequently resuspended in sporulation medium containing 1 μM β-estradiol to release from NDT80 block. The efficacy of benomyl treatment was confirmed by spindle morphology. See Hochwagen et al. (2005) for further technical details regarding benomyl resuspension in sporulation medium. MATa haploid cells carrying the MET-CDC20 or MET-CDC20 GAL-CDC5 GAL-MAM1 fusions and CENIV-GFP dots cultured in complete synthetic medium without methionine (CSM-MET) containing 2% raffinose were arrested in G1 with 5 μg/ml α-factor. For Figure 5A condition (1), cells were treated with galactose (to induce Cdc5 and Mam1 production) for 1 hr prior to α-factor release. When arrest was complete, cells were released into rich medium (YEP) with 2% raffinose lacking pheromone and containing 2% galactose, 1% DMSO and 8 mM methionine (to repress Cdc20 production). 8 mM methionine was added every hour to maintain metaphase arrest. When metaphase arrest was complete, cells were released into CSM-MET medium, containing 2% dextrose, 1% DMSO and 5 μg/ml α-factor. For condition (2), G1 arrested cells were released into YEP medium with 2% raffinose, lacking pheromone, containing 8 mM methionine and 1% DMSO. 8 mM methionine was added every hour to maintain the metaphase arrest. After 2 hr, cells were treated with 2% galactose for 1 hr and were subsequently released into CSM-MET medium, containing 2% dextrose, 1% DMSO and 5 μg/ml α-factor. For condition (3), G1 arrested cells were released into YEP medium with 2% raffinose, lacking pheromone, containing 8 mM methionine and 15 μg/ml nocodazole in DMSO. 8 mM methionine was added every hour to maintain the metaphase arrest. After 2 hr, cells were treated with 2% galactose for 1 hr and were subsequently released into CSM-MET medium, containing 2% dextrose, 1% DMSO and 5 μg/ml α-factor. Samples were taken every 15 min after release from metaphase arrest to determine GFP dot segregation in anaphase. Indirect immunofluorescence was performed as described in Kilmartin and Adams (1984). Spindle morphologies were classified as follows: metaphase I or metaphase I-like spindles were defined as a short, bipolar spindle spanning a single DAPI mass. Anaphase I spindles were defined as an elongated spindle spanning two distinct DAPI masses. Metaphase II spindles were defined as two short, bipolar spindles, each spanning a DAPI mass. Anaphase II spindles were defined as two elongated spindles, each spanning two distinct DAPI masses (four DAPI masses total). For Figure 8D,E, robust bipolar spindle was classified as a short, thick, bipolar spindle with equal intensity tubulin staining across the entire length of the spindle. A fragile spindle was classified as a short bipolar spindle with lower intensity tubulin staining in the middle of the spindle axis. Cells were induced to sporulate and CuSO4 was added at the indicated times. After 30–60 min post CuSO4 induction, cells were layered on a Concanavalin A (2 mg/ml; stock solution 20 mg/ml diluted in 50 mM CaCl2, 50 mM MnSO4) coated cover slip and assembled into an FCS2 fluidic chamber (Bioptechs Inc. Butler, PA). Sporulation medium was heated to 30°C, aerated using an aquarium air pump (Petco Animal Supplies, Inc. Cambridge, MA) and was perfused into the fluidic chamber using a peristaltic pump (Gilson Inc., Middleton, WI) with a flow rate of 4–7 ml/h. Alternatively, cells were induced to sporulate as above and transferred to a microfluidic chamber (CellASIC Corp. Hayward, CA). Cells were imaged using a Zeiss Axio Observer-Z1 with a 100× objective (NA = 1.45), equipped with a Hamamatsu ORCA-ER digital camera. 11 Z-stacks (1 micron apart) were acquired and maximally projected. Metamorph software was used for image acquisition and processing. Images for Figure 2B was processed using Metamorph deconvolution software. For Figure 2C, a cell was scored as harboring a separated pair of sister kinetochores if the heterozygous CENV-GFP dot signal underwent transient splitting for at least two time points for the duration of the movie. An aliquot of cells was fixed with 3.7% formaldehyde in 100 mM phosphate buffer (pH 6.4) for 10–15 min. Cells were washed once with 100 mM phosphate, 1.2 M sorbitol buffer (pH 7.5) and permeabilized with 1% Triton X-100 stained with 0.05 μg/ml 4′,6-diamidino-2-phenylindole (DAPI). Cells were imaged using a Zeiss Axioplan 2 microscope or a Zeiss Axio Observer-Z1 with a 100× objective (NA = 1.45), equipped with a Hamamatsu ORCA-ER digital camera. Openlab or Metamorph software was used for image acquisition and processing. 4 OD600 units of cells were harvested and spheroplasted with 0.1 mg/ml zymolyase 100T (Seikagaku Corp, Japan) and 15 mM DTT in solution 1 (2% potassium acetate, 0.8% sorbitol) for 10–13 min at 37°C. Ice-cold solution 2 (100 mM MES [pH 6.4], 1 mM EDTA, 0.5 mM MgCl2, 1 M sorbitol) was added to stop spheroplasting and cells were centrifuged at 2500 rpm for 2–3 min. The supernatant was discarded and the pellet was gently resuspended in 100–200 μl of solution 2. 15 μl of the resuspension was spread onto a glass slide. Subsequently, 30 μl of fixative solution (4% paraformaldehyde, 3.4% sucrose), 60 μl of 1% lipsol and 60 μl of fixative solution were added on top of cell suspension and spread using a glass rod seven to ten times back and forth. The slides were dried for at least 2 hr at room temperature, rehydrated in PBS pH 7.4, blocked with 0.2% gelatin, 0.5% BSA in PBS, and stained as described in the ‘Antibody’ section. For quantifications of spread nuclei, images were acquired using a Zeiss Axioplan 2 microscope or a Zeiss Axio Observer-Z1 with a 100× objective (NA = 1.45), equipped with a Hamamatsu ORCA-ER digital camera. Openlab or Metamorph software was used for image acquisition and processing. 40–100 spread nuclei were counted for each sample, except for strain A31955 in Figure 8B (n = 28). Two proteins were identified as colocalized in spread nuclei when more than 90% of foci overlapped. They were defined as partially colocalized when the overlap between foci was approximately 50% and as mislocalized when the overlap was negligible. In vitro kinase assays were performed as described in Carlile and Amon (2008) with the following modifications: 1 mg of total protein was incubated with 40 μl of 50% slurry anti-V5 agarose affinity gel (Sigma, St. Louis, MO) for 2 hr at 4°C. One half of the immunoprecipitate was used for the in vitro kinase assay, while the other half was used for Western blotting to detect Cdc28-3V5. For immunoblot analysis, ∼10 OD600 units of cells were harvested and treated with 5% trichloroacetic acid for at least 10 min at 4°C. The acid was washed away with acetone and the cell pellet was subsequently dried. The cell pellet was pulverized with glass beads in 100 μL of lysis buffer (50 mM Tris–HCl at pH 7.5, 1 mM EDTA, 2.75 mM DTT, complete protease inhibitor cocktail [Roche, Basel, Switzerland]) using a bead-beater (Biospec Products, Inc. Bartlesville, OK). 3× SDS sample buffer was added and the cell homogenates were boiled. Standard procedures for sodium dodecyl sulfate–polyacrylamide gel electrophoresis (SDS-PAGE) and Western blotting were followed (Laemmli, 1970; Towbin et al., 1979; Burnette, 1981). A nitrocellulose membrane (VWR International LLC, Radnor, PA) was used to transfer proteins from polyacrylamide gels. Antibody dilutions are described in the ‘Antibody’ section. 1 ml aliquot of a meiotic culture was spun down and the pellet was re-suspended in 70% ethanol and fixed for at least 60 min. Ethanol was removed and the cell pellet was washed with 50 mM sodium citrate, pH 7 and sonicated for 6 s at 50% output. The sample was subsequently incubated with 0.25 mg/ml Ribonuclease A (Sigma, St. Louis, MO) in 50 mM sodium citrate overnight at 37°C, washed once with 50 mM sodium citrate and re-suspended in 50 mM sodium citrate with either 1 µM Sytox Green (Molecular Probes, Carlsbad, CA) or 16 µg/ml propidium iodide (Sigma). Samples were analyzed using FACSCalibur (Becton Dickenson Co. Franklin Lakes, NJ). ∼20 OD600 units of cells were harvested and treated with sodium azide (0.1% final concentration). Cells were pelleted and snap frozen in liquid nitrogen. Genomic DNA was extracted as follows: Cells were washed once in TE and spheroplasted with 1/100 volume of beta-mercaptoethanol and 250 μg/ml zymolyase T100 in spheroplasting buffer (1 M sorbitol, 42 mM K2HPO4, 8 mM KH2PO4, 5 mM EDTA) for 30 min at 37°C on a rotating rack. 100 μl preheated (65°C) lysis buffer (1:1 mix of 1 M Tris pH 8 and 0.5 M EDTA, 2.5–3% SDS) was added and mixed by inverting. 15 μl proteinase K (18 ± 4 mg/ml PCR grade solution; Roche, Basel, Switzerland) was added and incubated at 65°C for ∼1.5 hr. Subsequently, 150 μl 5 M potassium acetate was added, mixed by inverting and transferred to 4°C for 10 min. Samples were centrifuged at 4°C for 20 min and 650 μl of supernatant was transferred into a 2 ml tube containing 750 μl 100% ethanol, avoiding as much of the white fluff as possible. Samples were mixed by inverting and left at 4°C for 10 min. Nucleic acid was precipitated at 15,000 rpm for 10 min, 4°C. Samples were subsequently resuspended in TE and treated with RNase A (50 μg/ml; Roche), for 15–20 min at 37°C and kept at 4°C overnight. DNA was extracted with phenol/chloroform/isopropanol and was resuspended in 125 μl TE. XhoI-MluI digested DNA fragments were separated on 0.6% agarose gel in 1× TBE and transferred onto Hybond-XL plus membranes (GE Healthcare Biosciences, Pittsburgh, PA) by alkaline transfer. Southern blotting was performed as previously described (Hunter and Kleckner, 2001). Spindle morphology was determined using a rat anti-tubulin antibody (Serotec, Kidlington, UK) used at a dilution of 1:100, and anti-rat FITC antibodies (Jackson ImmunoResearch Laboratories, Inc. West Grove, PA) used at a dilution of 1:100–200. Lrs4-13myc, Rec8-13myc, Ask1-13myc and Mam1-9myc were detected using a mouse anti-myc antibody (Covance, Princeton, NJ) at a 1:500 dilution. Rec8-3HA and Hsk3-3HA were detected using a mouse anti-HA antibody (HA.11; Covance) at a 1:1000 dilution. Hsk3-3V5, Ndc80-3V5 and Dam1-3V5 were detected using a mouse anti-V5 antibody (Invitrogen, Carlsbad, CA) at a 1:2000 dilution. Pgk1 was detected using a mouse anti-Pgk1 antibody (Molecular Probes, Carlsbad, CA) at a 1:10,000 dilution. Clb3 was detected using a rabbit anti-Clb3 antibody (Sc7167; Santa Cruz Biotechnology Inc. Santa Cruz, CA) at a 1:500 dilution. Kar2 was detected using a rabbit anti-Kar2 antibody (kindly provided by Mark Rose) at a 1:200,000 dilution. The secondary antibodies used were a sheep anti-mouse antibody conjugated to horseradish peroxidase (HRP) (GE Healthcare Biosciences, Pittsburgh, PA) at a 1:5000 dilution or a goat anti-rabbit antibody conjugated to HRP (BioRad, Hercules, CA) at a 1:10,000 dilution. Antibodies were detected using the SuperSignal West Pico Chemiluminescent Substrate (Thermo Scientific, Waltham, MA). Rec8-3HA was immunoprecipitated using 2–5 μg of rat anti-HA antibody (3F10; Roche, Basel, Switzerland) in combination with 50 μl of 50% slurry Protein G beads (Roche). Rec8-13myc was immunoprecipitated using 2–5 μg of mouse anti-myc antibody (9E11) in combination with 50 μl of 50% slurry Protein G beads (Roche). Sgo1-3V5 and Spo13-3V5 were immunoprecipitated with 40–50 μl of 50% slurry anti-V5 agarose affinity gel (Sigma, St. Louis, MO). Pds5 was immunoprecipitated using 1.3μl of rabbit anti-Pds5 antibody (kindly provided by Vincent Guacci) in combination with 50 μl of 50% slurry Protein A beads (Roche). Phosphorylated Rec8 was immunoprecipitated using 2 μg of rabbit anti-phospho-S179 Rec8 or rabbit anti-phospho-S521 Rec8 in combination with 50 μl of 50% slurry Protein A beads (Roche). Lrs4-13myc, Ndc10-13myc, Sgo1-9myc, Rts1-13myc, Rec8-13myc, Ask1-13myc, and Mam1-9myc were detected using a preabsorbed rabbit anti-myc antibody (Gramsch, Schwabhausen, Germany) at a 1:400 dilution. Ndc10-6HA and Rec8-3HA were detected using either a preabsorbed mouse anti-HA antibody (HA.11; Covance, Princeton, NJ) or a rat anti-HA antibody (3F10; Roche, Basel, Switzerland) at a 1:400 dilution. Ndc80-3V5 was detected using a mouse anti-V5 antibody (Invitrogen, Carlsbad, CA) at a 1:400 dilution. Zip1 was detected using y-300 rabbit antibody (Santa Cruz Biotechnology Inc. Santa Cruz, CA) at a 1:400 dilution. Rad51 was detected using y-180 rabbit IgG (Santa Cruz Biotechnology Inc.) at a 1:400 dilution. Secondary antibodies used were preabsorbed anti-rabbit FITC antibody (Jackson ImmunoResearch Laboratories, Inc. West Grove, PA), preabsorbed anti-rat CY3 antibody (Jackson ImmunoResearch Laboratories, Inc.) or preabsorbed anti-mouse CY3 antibody (Jackson ImmunoResearch Laboratories, Inc.) at a 1:400–1:800 dilution. Cluster analysis of the ribosome footprinting data for the kinetochore components listed in Figure 6—figure supplement 1 was performed using Cluster 3.0. Genes were clustered by hierarchical average based on Spearman correlation using mean centered arrays. Clustering data (Figure 6B, Figure 6—figure supplement 2) were visualized using Java Treeview. Note that ribosome footprints are normalized such that the sum of expression across the time course is equivalent for each gene. For plots in Figure 6C,D and Figure 6—figure supplements 3–10, mRNA-seq and ribosome footprinting data were plotted for indicated genes based on the dataset from Brar et al. (2012). The meiotic stages plotted on the x-axis are in the following order: vegetative (gb15 exponential and A14201 exponential), meiotic entry (1, A, B and D), DNA replication (E and F), recombination (G and I), prophase I (3 and 4), metaphase I (5 and 6), anaphase I (7 and 8), metaphase II (9 and 10), anaphase II (11, 12 and 13) and spore formation (15 and 18). The detailed explanation of the above letter and number codes can be found in Brar et al. (2012). Chi-square (χ2) tests were performed using GraphPad Prism 6.0 software with two-tailed P values and 95% confidence intervals. Corresponding degrees of freedom (df), χ2 and P values are shown in the figure legends. “Western blotting”: electrophoretic transfer of proteins from sodium dodecyl sulfate–polyacrylamide gels to unmodified nitrocellulose and radiographic detection with antibody and radioiodinated protein A.
Proc Natl Acad Sci USA 107:2467–2472. Nat Rev Mol Cell Biol 5:983–997. Annu Rev Cell Dev Biol 13:261–291. Proc Natl Acad Sci USA 92:8512–8516. Proc Natl Acad Sci USA 76:4350–4354. Cold Spring Harb Perspect Biol 3:a005553. Thank you for choosing to send your work entitled “Meiosis I Chromosome Segregation is Established by Inhibiting Microtubule-Kinetochore Interactions in Prophase I” for consideration at eLife. Your article has been evaluated by a Senior Editor and 3 reviewers, one of whom is a member of eLife's Board of Reviewing Editors. The Reviewing Editor and the other reviewers discussed their comments before we reached this decision, and the Reviewing Editor has assembled the following comments based on the reviewers' reports. Our goal is to provide the essential revision requirements as a single set of instructions, so that you have a clear view of the revisions that are necessary for us to publish your work. Amon and colleagues previously showed that aberrant expression of Clb3 in meiotic prophase I induces sister segregation in the first meiotic division. Here, Miller et al. show that this is due to early development of bipolar spindles and present evidence that premature kinetochore-microtubule attachments disrupt normal morphogenesis of kinetochores and pericentric cohesion. That these connections must be at least transiently disrupted to allow development of monopolar kinetochores and in particular a protective cohesin domain formed around the centromeres is an important and new discovery. This is a typical tour de force effort from the Amon lab, with cleverly designed and well-executed experiments and several novel observations. The data are for the most part impeccable. However, the simple message is perhaps lost by emphasis on other points that are either overstated or speculative without careful comment to these issues. Furthermore, certain novelty claims are unwarranted and need rewriting (see point 1). Substantial points that must be addressed in a revision are given below in no particular order with regard to significance. 1. The paper of Asakawa et al. (MBC 2005) should be discussed earlier and more comprehensively. Presenting this information in the discussion section as it now reads is confusing. 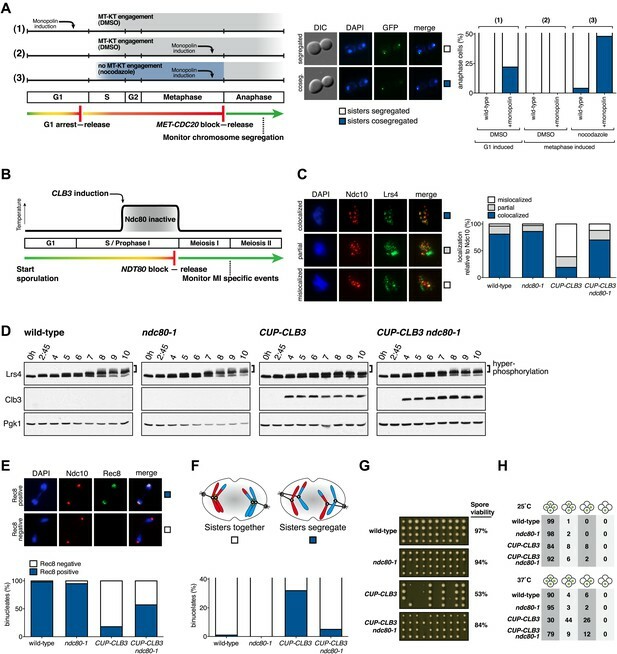 This paper demonstrated meiosis-specific disassembly of the outer kinetochore (the S. pombe Nif2-Ndc80 complex) and indicated that this is required for reductional segregation at MI. Moreover, Asakawa also showed that this process requires the Pat1 kinase, the Mei2 regulator of meiotic transcript stability, and mating-pheromone signaling. The current study in this regard is an advance in important ways, that this is critical in part for connections, but does not supersede it. 2. It's surprising that there is no figure at the beginning of the Results showing westerns of CLB overexpression. It is important to see timing and know how the overexpression compares to the levels that normally form in WT. There are such figures for Clb3 later, e.g., in panels of Fig 2B and Fig S2B, but there is no explicit discussion of what's seen with respect to timing or levels, and the other CLBs are not shown. It would be interesting to know if the differences in phenotypes detected for the specific cyclins were because of kinase protein levels or activities? One of the most interesting points developed in the present story was that Clb4 expression was only capable of disrupting SPB but not cohesion – is this specificity or levels? 3. Most of the data are superb, but the recombination Southern and quantification are not (fig S1E): FigureS1E shows that recombination is not normal in GAL-CLB3 cells - the crossovers form earlier (at least 1 hr and with biphasic kinetics) and at lower levels than seen in wild type. However, the authors claim that recombination is normal when CLB3 is prematurely expressed. This is a contradiction that needs to be addressed. In fact, it is hard to believe that the quantification is accurate since it indicates that products are showing up at high levels already at 3 hr in the GAL-CLB3 strain, even though no products are obvious on the Southern at this time point. Also, it seems a bit odd to include DSBs along with recombinant DNA molecules as “recombination products”. 4. We are concerned about the physiological relevance of a number of experiments. While the phenomena described here are fascinating, how relevant is the pathology associated with very early, very high expression of Clb3 for understanding wild-type meiosis? This needs some discussion and balance with regard to proof versus speculation. The introduction section does not make a link to how over-expression might be used to learn about the normal process. Further some conclusions remain speculative with the approach and should be stated as such. A) For example, with respect to the physiological role of outer-kinetochore disassembly during prophase, the authors' interpretation is that this process is redundant with suppression of cyclins in preventing premature kinetochore-spindle connections. But it seems that prevention of prophase spindle assembly completely overrides any need to disassemble the outer kinetochore; bipolar spindles never form in prophase I (Figure 1). B) Moreover, artificial assembly of the outer kinetochore in prophase I (CUP-NDC80 CUP-HSK3) does not influence MI segregation unless CLB3 is also artificially expressed. This is an important paradox that must be addressed. It remains completely unproven whether the physiological role of outer kinetochore disassembly in prophase I is to prevent premature spindle-kinetochore connections. It seems equally possible that SPB-kinetochore connections must be dissociated for normal execution of prophase I events, e.g. telomere-nuclear envelope attachment, chromosome movement, etc. 5. For most experiments, CUP-CLB3 is induced so early that cells may still be in S phase. FACs analysis for representative time courses should be shown. The induction of Ndt80 expression at 4.5 hrs is also questionably early - has a majority of the culture reached the ndt80 arrest point at 4.5 hrs? The concern is that early, non-physiological expression of Cdc5 is also occurring in these experiments and may actually be required for the observed phenomena. What happens if Ndt80 is expressed later? There isn't a single time-course in this paper to demonstrate when MI occurs in a typical wild-type culture. The time-course in FigureS1E shows that crossovers don't form until 7 hrs making it unlikely that cells were in mid/late pachytene at 4.5 hrs. 6. Similarly it is an overstatement to write categorically that the work shows two independent mechanisms for timely engagement of the microtubules with the kinetochore. Manipulating the synthesis of the outer kinetochore proteins enhances the Cdk effects, but perhaps this is because the unknown kinase targets are not completely modified? One might suggest that the transcription or translation of the kinetochore proteins is regulated by a repressor whose activity is ablated by Cdk function. We have included a detailed discussion of the Asakawa paper in the Results section. Several points are of importance here. First, Clb3 produced from the GAL1-10 promoter (and driven by estrogen induction) is expressed at similar levels as endogenous Clb3. This was demonstrated in Carlile and Amon (2008) and is now mentioned in the text. Thus, when Clb3 is driven from the GAL1-10 promoter the protein is not overexpressed, just prematurely expressed. Expression from the CUP1 promoter results in a 5-fold overexpression compared to the GAL1-10 promoter. This is now shown in Figure 1B. Importantly, the degree of expression has no effect on the phenotype. The percentage of cells segregating sister chromatids during meiosis I is similar in CUP-CLB3 and GAL-CLB3 cells (shown in Figure 1C). This result indicates that degree of ectopic expression is irrelevant for the phenotype. The only aspect that matters is premature expression. This is now explained in detail in the text. The reader may further wonder why we did not use the GAL-CLB3 construct but instead used the CUP-CLB3 fusion for most of our experiments, if the former only leads to premature expression but the latter to premature expression and overexpression. This is now also explained. Figure 1A shows that estrogen addition during early stages of sporulation interferes with meiotic progression, precluding the analysis of the meiotic products. Finally, as requested by the reviewers we have compared protein levels and kinase activity of the various cyclins expressed from the CUP1 promoter. Figure 1D shows that the various Clb cyclins are expressed at similar levels when driven from the CUP1 promoter. Figure 1F shows that there is no correlation between the amount of kinase activity produced by the various cyclins expressed from the CUP1 promoter and the ability to induce sister chromatid segregation during meiosis I. Thus cyclin specificity, not quantity, is responsible for the differences in phenotype. We re-quantified the recombination products by taking the ratio of R2 over P1. The new graph displayed in Figure 2 – Figure Supplement 5 shows no significant impact of prematurely expressed CLB3 on recombination. The reviewers are concerned that our analyses solely rely on experiments that overexpress CLBs and that the “pathology” described here has no bearing on the effects of CLBs in wild-type meiosis. We fundamentally disagree with this assessment. First, as described in Carlile and Amon (2008) and now explicitly mentioned in the revised manuscript, expression of CLB3 from the GAL1-10 promoter does not lead to non-physiological levels of Clb3. The levels produced from the GAL1-10 promoter during meiosis I are the same as observed in wild-type cells during meiosis II. More importantly, Figure 1C shows that amount of premature Clb3 expression does not impact the phenotype. The degree of meiosis I sister chromatid segregation is similar in GAL-CLB3 and CUP-CLB3 cells. This is discussed extensively in the revised manuscript. Second, one must ask whether there is a method other than expressing CLB3 from a heterologous promoter to determine why so many mechanisms, namely transcriptional and translational inhibition, are in place to keep Clb3-CDKs low during meiosis I. To our knowledge, expression from a heterologous promoter is the only way to effectively override such control mechanisms and examine the consequences of loss of these controls. Of course, without a spindle chromosomes cannot segregate. As spindle formation is a prerequisite for the observed phenotype, Clb-CDK expression is an absolute must. However three observations indicate that both, a cyclin-CDK induced bipolar spindle and a functional kinetochore must be present during prophase I in order to cause premature microtubule-kinetochore interactions that ultimately result in meiosis I chromosome segregation defects. First, CLB3-induced meiosis I chromosome segregation defects are completely dependent on a functional kinetochore during prophase I (Figure 5 and Figure 5 – Figure Supplement 5). Second, whereas early CLB3 misexpression causes defects in meiosis I chromosome segregation, CLB3 misexpression during late prophase I has no effect on chromosome segregation (Figure 6A). This difference is likely due to the outer kinetochore being present during premeiotic S phase and early prophase I but not late prophase I (Figure 6E). Most importantly, during late prophase I, only both, CLB3 and outer kinetochore component expression, are able to induce meiosis I sister chromatid segregation (Figure 8G, Figure 9). This result demonstrates that the presence of cyclin alone during late prophase I is not sufficient to cause sister chromatid segregation during meiosis I, and that both pathways must be repressed during prophase I to establish the meiosis I-specific chromosome segregation pattern. These arguments have been added to the discussion to ensure that the reader understands the contribution of Clb-CDK induced premature spindle formation and outer kinetochore assembly to the observed phenotype. B) Moreover, artificial assembly of the outer kinetochore in prophase I (CUP-NDC80 CUP-HSK3) does not influence MI segregation unless CLB3 is also artificially expressed. This is an important paradox that must be addressed. 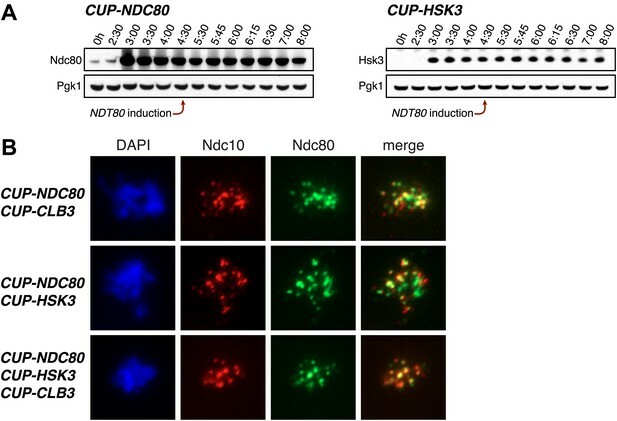 Ectopic expression of Ndc80 and Hsk3 alone does not affect meiosis I chromosome segregation, but neither does CUP-CLB3 when expressed only during late prophase I. The only point we are trying to make here is that in addition to formation of the spindle early in prophase I, a functional kinetochore must be present to observe a phenotype. Our data clearly show that outer kinetochores are disassembled during prophase I and that this disassembly precludes CUP-CLB3 from interfering with meiosis I chromosome segregation. As mentioned above, we extended the discussion of these points to make this conclusion clearer. It remains completely unproven whether the physiological role of outer kinetochore disassembly in prophase I is to prevent premature spindle-kinetochore connections. It seems equally possible that SPB-kinetochore connections must be dissociated for normal execution of prophase I events, e.g. telomere-nuclear envelope attachment, chromosome movement, etc. It is entirely possible that disassembly of the outer kinetochore serves additional purposes. This possibility is now mentioned in the Discussion. New Figure 1E shows progression of wild-type cells through sporulation. By 2:15 hours, 43.2 percent of cells have replicated their DNA, by 4.5 hours all cells are in G2. Using very similar conditions a recent publication by Blitzblau et al. (PLOS Genetics 2012) has reported even faster kinetics with bulk DNA replication being completed by 3 hours. Sporulation kinetics vary significantly between experiments and in earlier experiments we observed divisions as early as 4 hrs in an unperturbed meiosis. These fast kinetics are most likely due to the fact that most of the strains we used for these studies were prototrophs. It should also be noted that the strains used in old Figure S1E (new Figure 2 – Figure Supplement 5) are not prototrophic which results in slower meiotic kinetics. However the reviewers are correct in that not all cells have replicated their DNA yet by 2:15 hours. Thus we modified the text to indicate that the bulk of cells are in S phase or early prophase I. The reviewers were also concerned that premature expression of NDT80 and its target CDC5, 4.5 hours after transfer into sporulation medium could contribute to the observed phenotypes. We have addressed this concern by examining chromosome segregation when NDT80 was expressed substantially later, 6, 7 or 8 hours after induction of sporulation. At these times all cells had arrested in pachytene as judged by FACS analysis. The data in new Figure 9 show that concomitant expression of NDT80 from the GAL1-10 promoter and CLB3, NDC80 and HSK3 from the CUP1 promoter after 6, 7, or 8 hours in sporulation medium leads to a similar phenotype as expression of the genes after 4.5 hours in sporulation medium. Thus, expression of NDT80 early during meiosis, 4.5 hours after transfer into sporulation medium, is not responsible for the observed phenotypes. Furthermore, meiosis I sister chromatid segregation is also seen in cells lacking the NDT80 block release system (Carlile and Amon, 2008, Figure 1C). The reviewers’ assessment is only accurate when Clb3-CDKs are expressed during premeiotic S phase/early prophase I. As mentioned above, when the outer kinetochore is fully disassembled, by late prophase I, Clb3-CDK misexpression alone is insufficient to cause MI sister chromatid segregation (Figure 6A, 8G, and Figure 9). A scenario where outer kinetochore assembly is under Clb-CDK control is possible, but unlikely. Such a mechanism is not expected to be sensitive to when Clb3-CDKs are expressed during prophase I. We are grateful to Hong-Guo Yu, Vincent Guacci, and Wolfgang Zachariae for reagents, Hannah Blitzblau, Gerben Vader, Jingxun Chen, Kristin Kuhn, Kristin Knouse, Ann Thompson, André and Charles Felts for technical assistance, Steve Bell, Leon Chan, Dean Dawson, Doug Koshland, Andrew Murray, Terry Orr-Weaver and members of the Amon lab for their critical reading of this manuscript. © 2012, Miller et al.